Lions Seemed Everywhere And Even Around The Tents At Dinner Time! This was a long anticipated trip at the top of our bucket list. 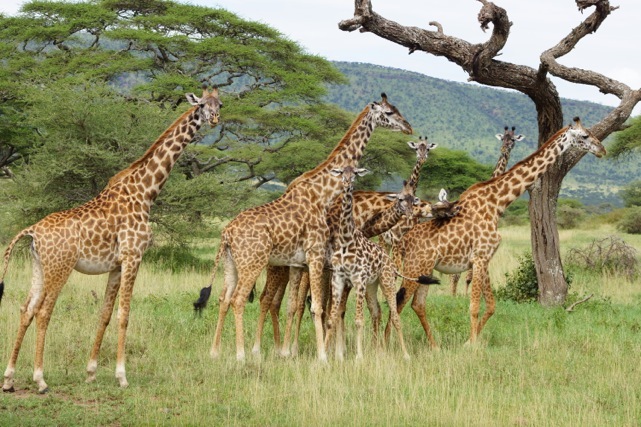 We had looked for several years at various safari tour companies, mostly group tours until we discovered Africa Dream Safaris and their private tours. We are two couples who have traveled all over the world for over twenty years. All ADS Safari Goers Say This But We Had The Best Guide! My husband and I just got back from a 10 night safari with ADS. It was even better than we had expected! 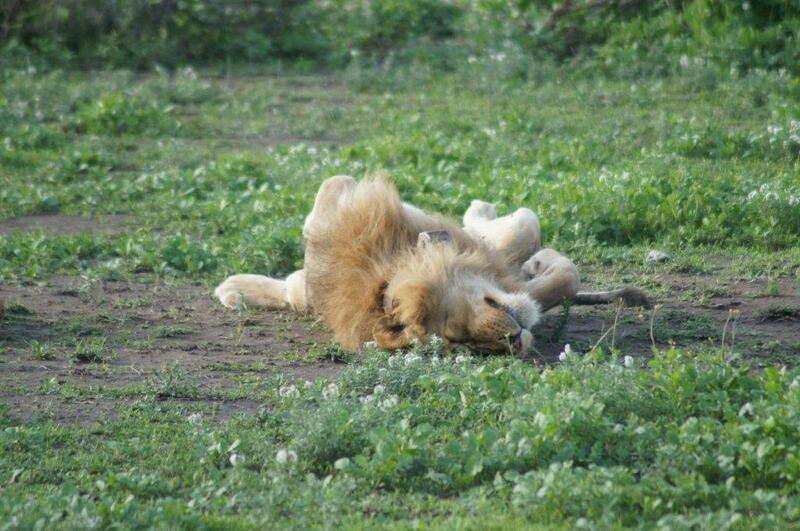 The 2 nights in Arusha on the front end was a good decision, to rest up after long flights from the US. The Lake Duluti Coffee Lodge had very nice accommodations. This is where the culinary delights started and continued throughout the trip. Thank You ADS For A Fantastic Experience! 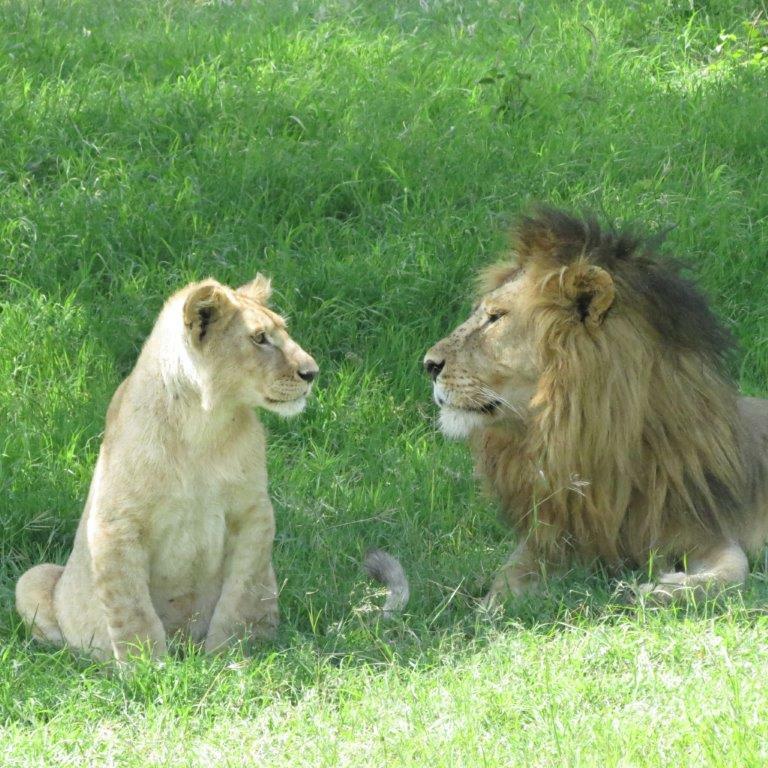 Five years ago, my wife and I went on our first African safari with ADS. It was truly a trip of a lifetime! It was during that trip that we said to each other, We need to bring our grandchildren back here when they get old enough, and see this through their eyes! Well, our two oldest grandchildren are 13 and 15, and we felt this was the year to fulfill that wish. 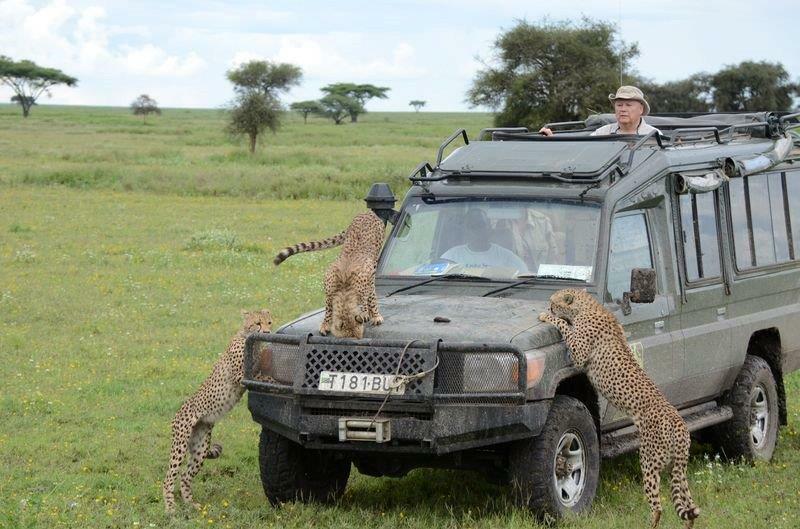 Tanzania Is Truly A Safari Paradise! 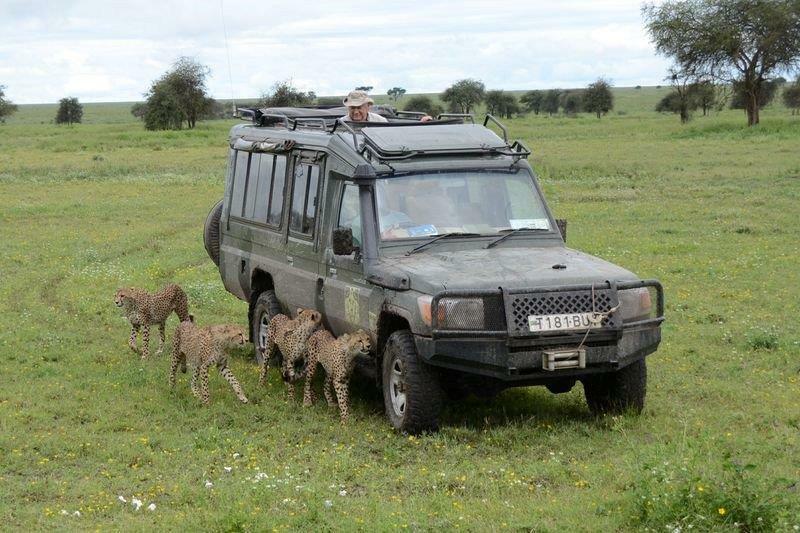 This was our third trip to the Serengeti and Ngorongoro Carter with Africa Dream Safaris and it was as exciting as ever. We took friends along as it was their dream vacation. We told them we were going to be staying in tents and how luxurious that would be and they were pleasantly surprised at the upgraded accommodations. Our guide Russell was simply outstanding. 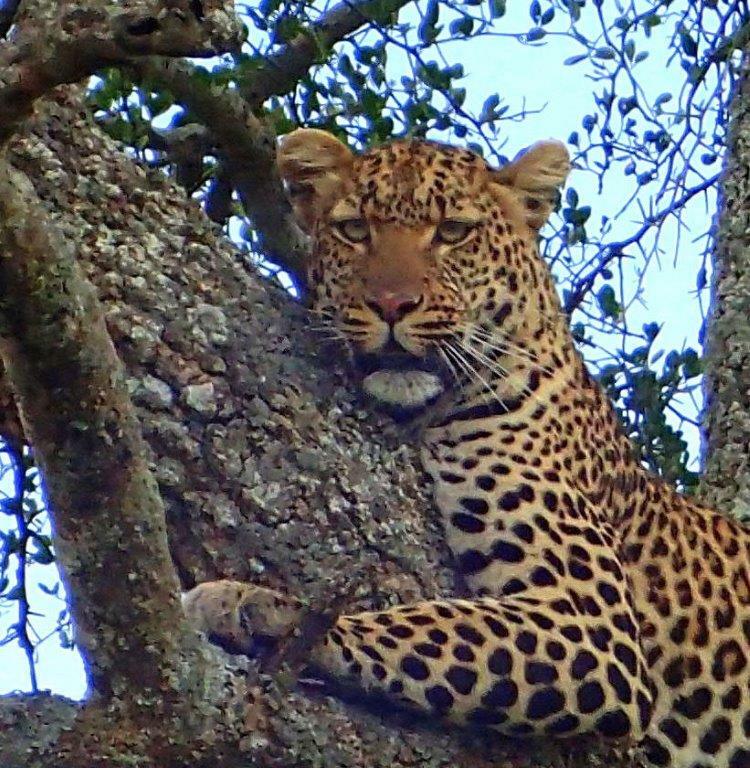 How he could see a leopard in a tree from a half mile away still amazes my husband and I. Africa Dream Safaris has the best guides in the business. We started out two nights in the Western Serengeti. 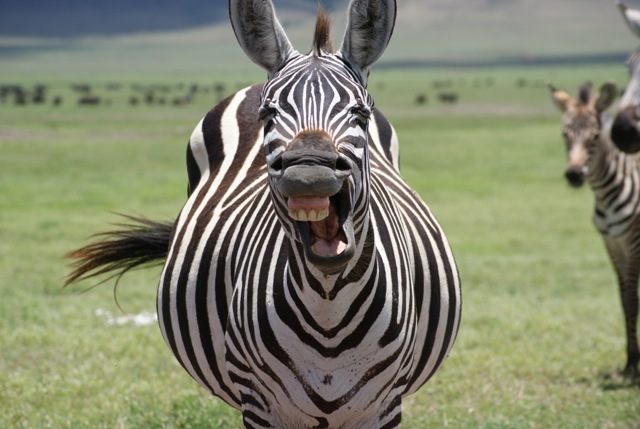 The Zebras were leading the way for the Wildebeest. 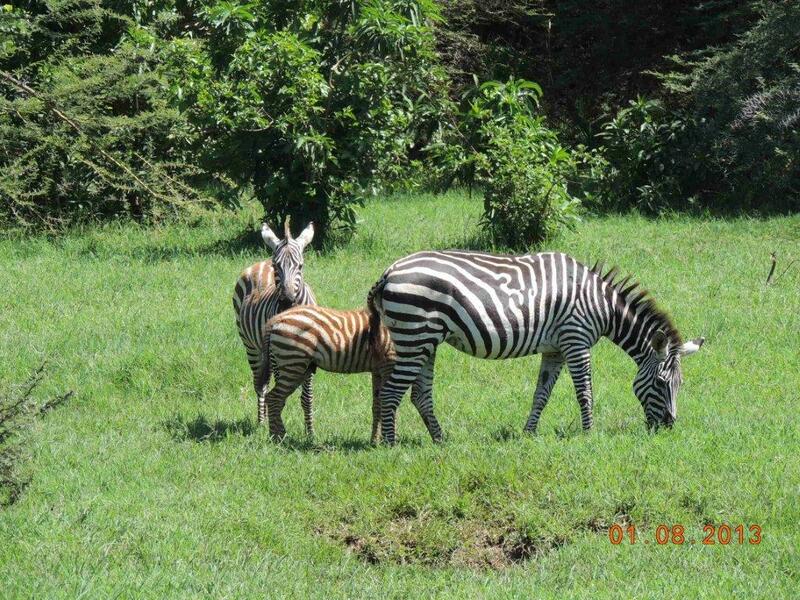 We saw thousands of Zebras and Topis, as far as you could see. Our friends were amazed what they saw the first two days and I told them it was just the tip of the iceberg! 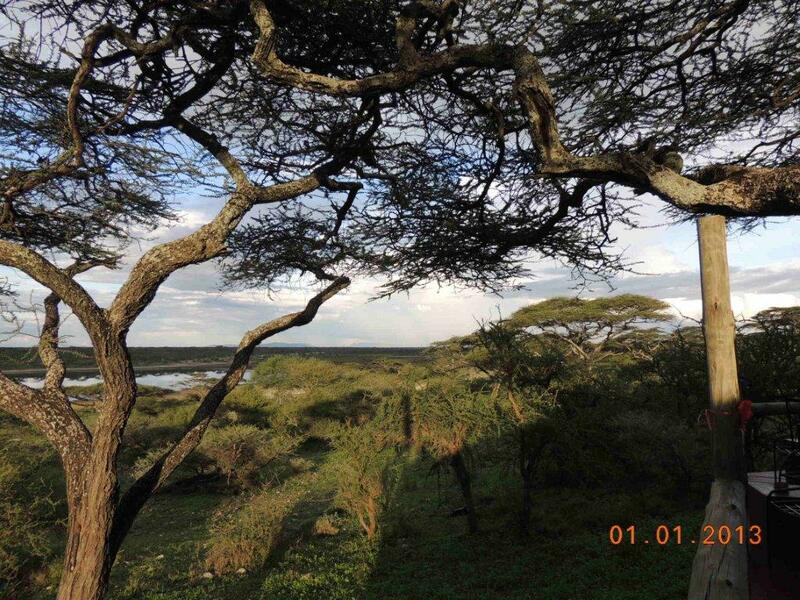 Next was the Central Serengeti for three nights. 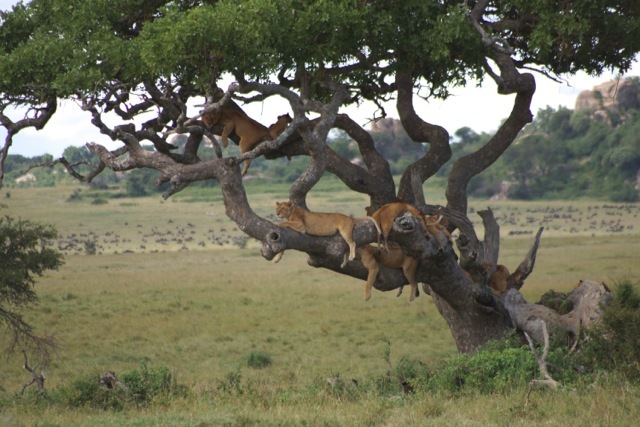 We saw lions in the tree relaxing in the heat of the day. 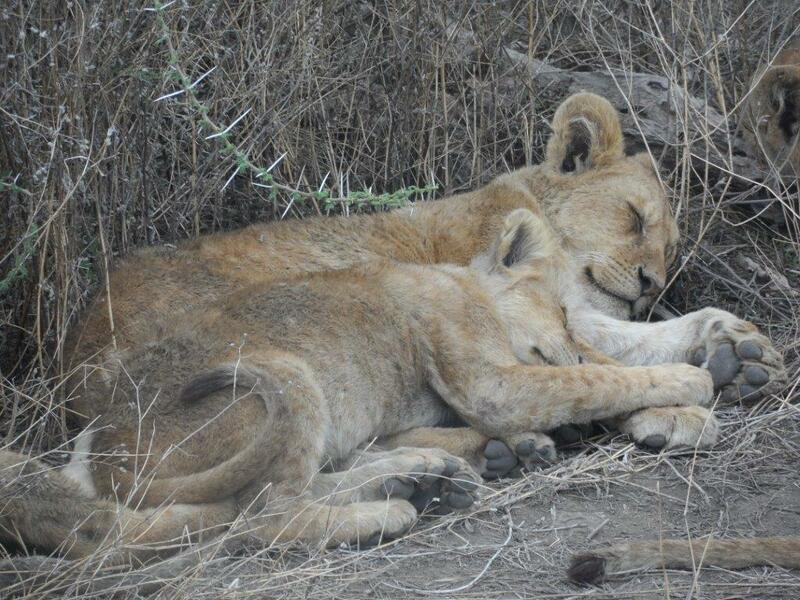 Later that day we came upon a small herd of elephants, but nearby on some tree branches were some lions resting. Our guide Russell said “let’s follow those elephants and see if they go towards the lions in the tree.” Oh my gosh…the elephants surrounded the tree with the lion up in it! The lion was frightened and just froze until the elephants wandered off. 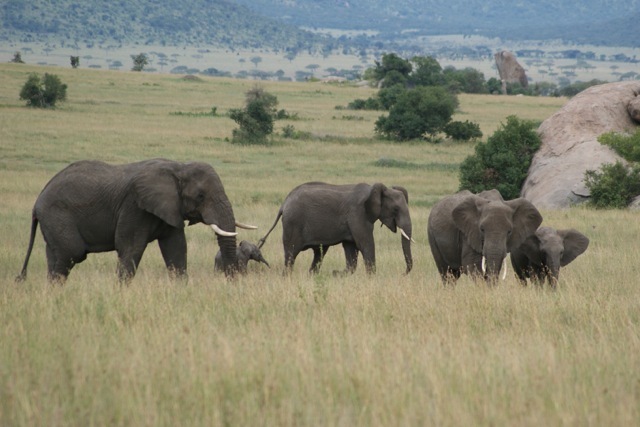 Next day we came upon a herd of elephants that numbered around 150. Russell said he had never seen so many elephants in one group. Ten minutes later we saw the main group of the migration. As far as the eye could see in all directions there were wildebeests and zebras…possibly 200,000. What an amazing site! 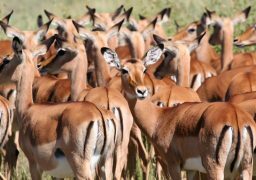 We could not believe how many different types of animals we saw including lions, leopards, elephants, cape buffalo, ostrich, hyenas, cheetah, black back jackals, topi, impala, grant gazelles, Thomson gazelles…the list is long. A for the birds, we lost count on all the different types we saw. After the Serengeti we visited the Ngorongoro Crater. 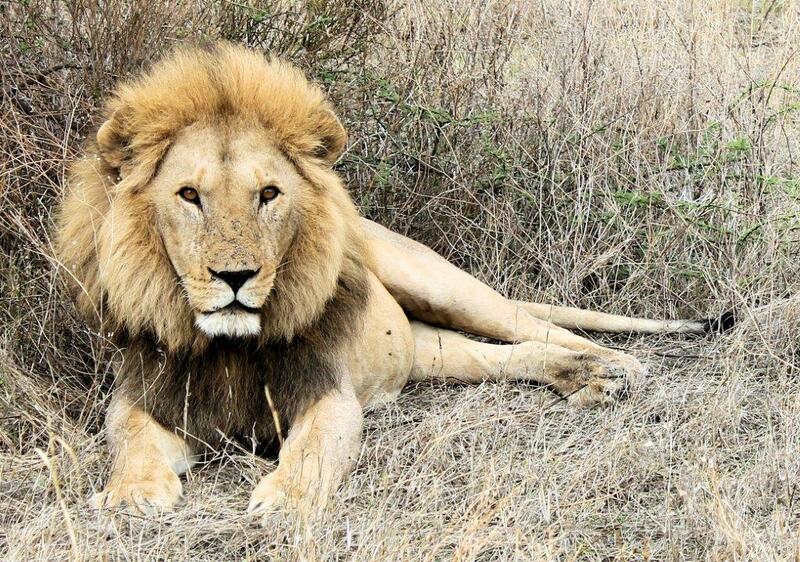 We watched early one morning as lions were stalking a cape buffalo, but unsuccessfully. 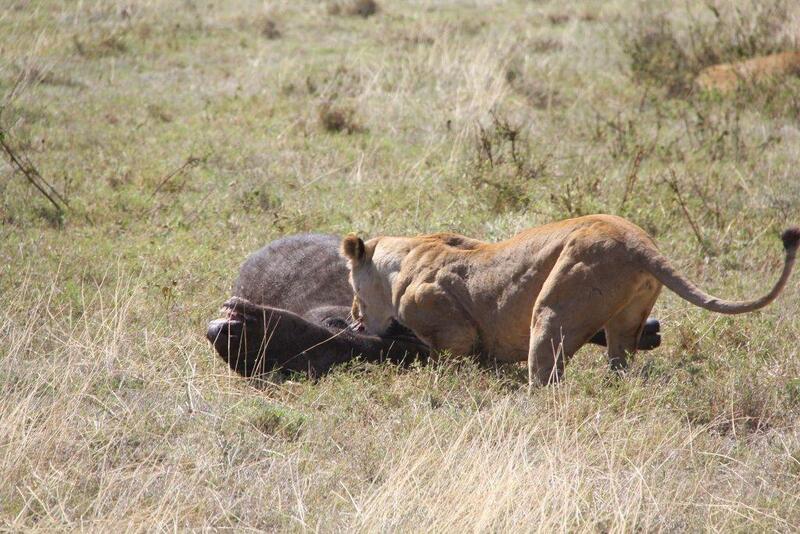 Later we watched a female lion sneak up to a single wildebeest, chase it but fall short of a kill. It was fun however to watch the chess game being played out in front of us in both situations. Finally we saw our first black rhino…only to see 4 more that afternoon. That finished out our Big Five. 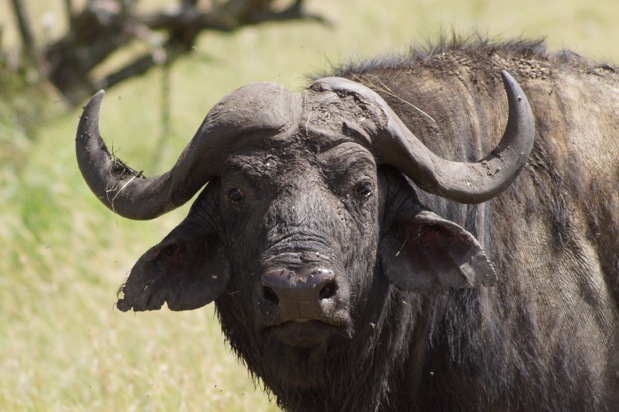 Several lion prides, lion cubs, several leopards, hyena families, the rare serval, several black rhinos, lots of hippos and their babies, giraffe families, angry cape buffalos, and a cast of tens of thousands of wildebeest and zebras. And don’t forget the breathtaking sunsets with deep orange and blue streaks. 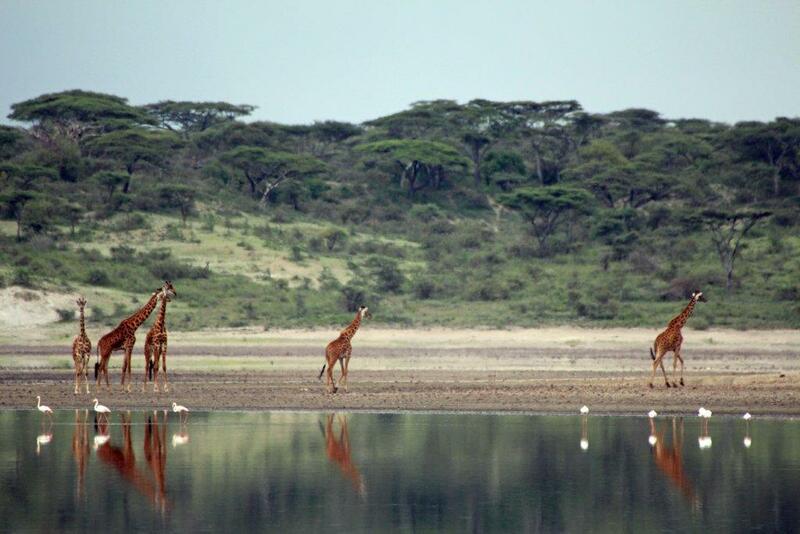 Tanzania is truly a safari paradise! It Was A New Adventure Every Day! 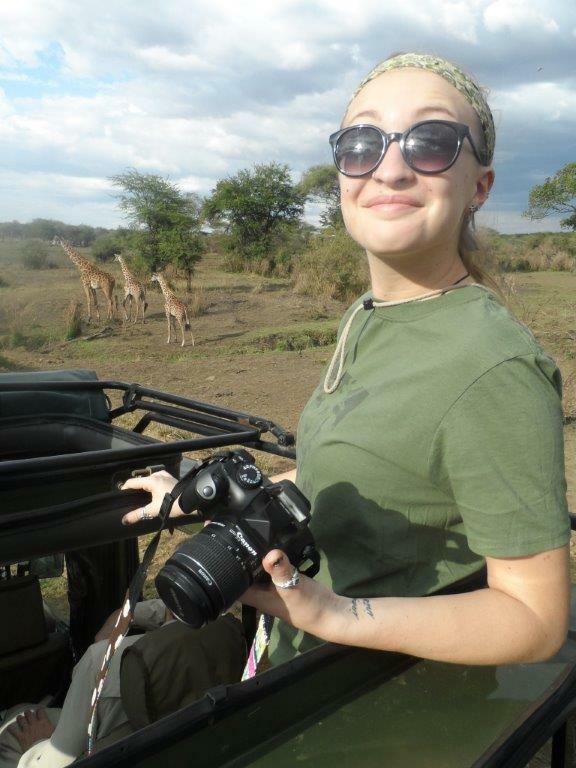 First of all, I want to thank Ellison (the best guide ever) for making my safari a memorable one. 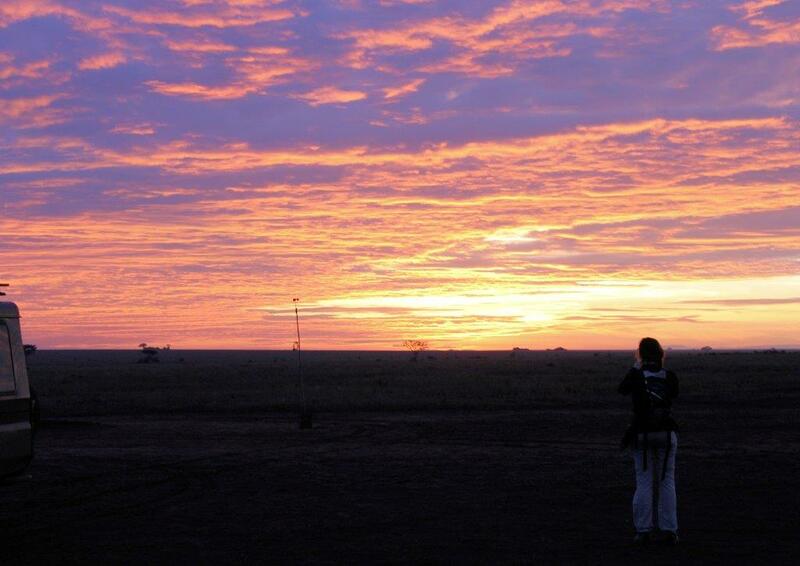 Also, Dawn at Africa Dream Safaris for putting everything together. It was a new adventure every day. We asked Ellison how he was going to make the next day better than the day before, and we were never disappointed. It was unbelievable. 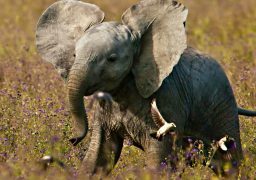 The Hippos, Cheetahs, Giraffes, Leopards, Zebras, Wildebeests, Hyenas, Lions, Elephants, Rhinos, Baboons, Monkeys and can’t forget the beautiful birds. It was amazing and so are my pictures. Niki B. and Richard W.
Moments That Took Our Breath Away! 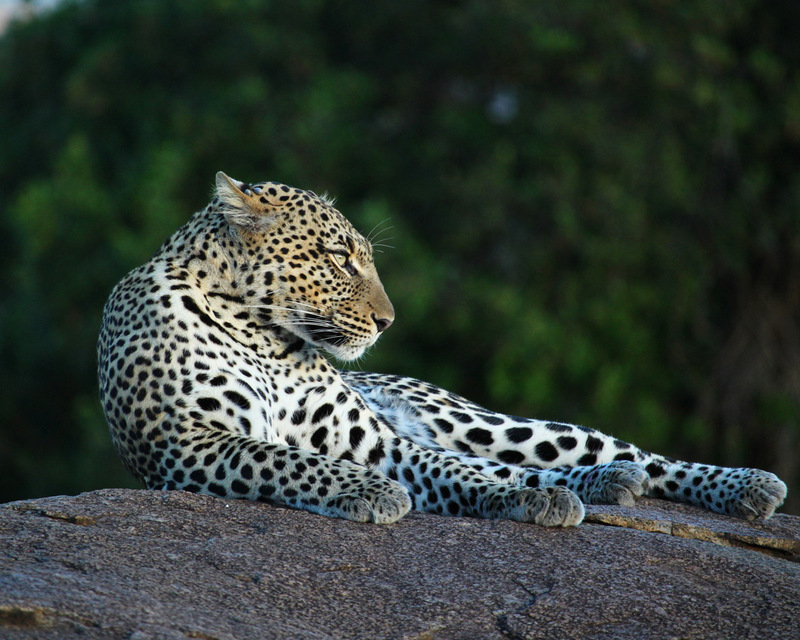 The above are just a few of the many treasures that are intermingled by many more animals that were unveiled through the keen eyes of a well-trained ADS guide and driver (Pokea): An expert not only in wildlife, but terrain, he managed to provide us with the utmost Safari experience. The ADS family may not be large in comparison to other providers, allowing them to focus on the quality of services and motivation to provide us with the best experience possible. The ADS family has exceeded our expectations exposing us with moments that took our breath away. The last five days (December 29, 2012-January 3, 2013) were spent in the tranquility of the Palms resort located on Zanzibar Island. 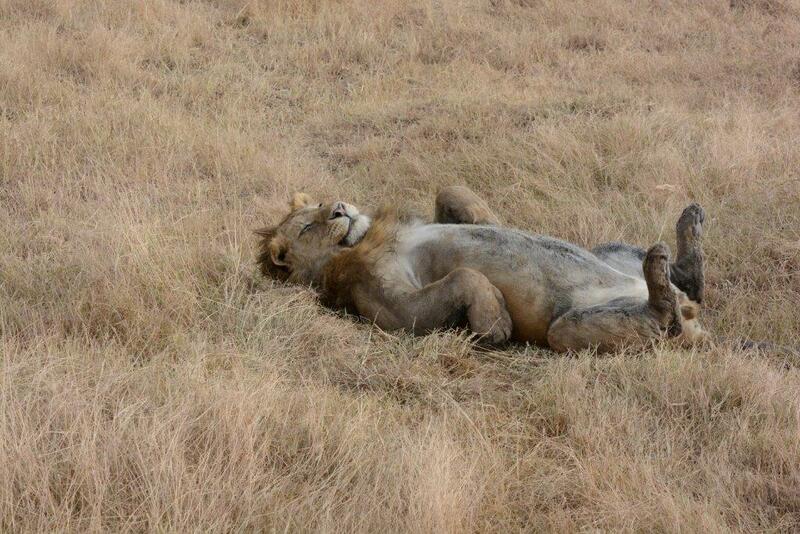 What a wonderful way to chill down and reflect on the safari adventure. The people of the Palms are to be commended for the service, exquisite cuisine, and the softening tranquility of the quiet surroundings. 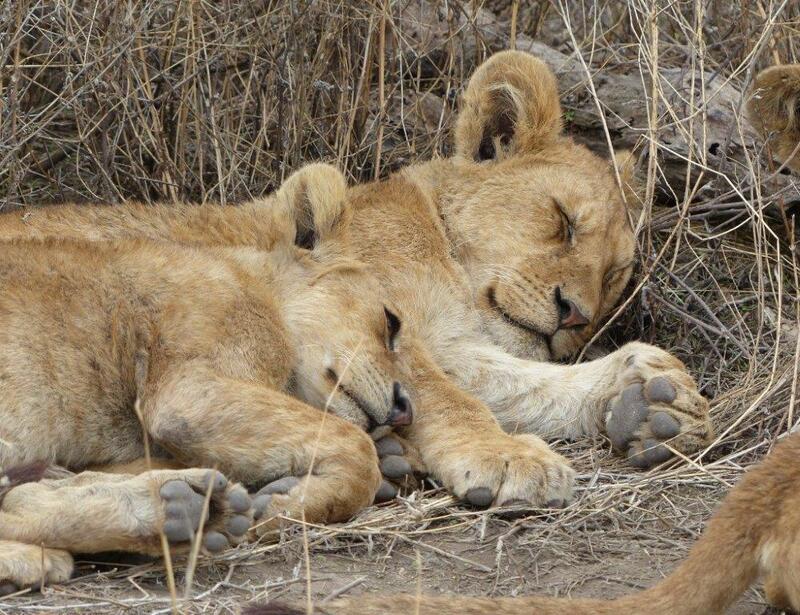 We had an absolutely amazing safari with Africa Dream Safaris, better than we ever dreamed possible. We loved having our own guide and vehicle, and the freedom to choose our own pace, according to the interesting sights and the weather. There were 4 of us, so we had room to spare for picture taking and for our daypacks as well as boxed lunches some days. From the moment we landed in Kilimanjaro, we were guided skillfully and patiently throughout our trip, even getting through customs smoothly with extra assistance from our guide. We saw everything we could have imagined, in abundance. We encountered dozens of elephants and baboons at a time, filling the road and crossing it, lion, zebra, and cheetah and zebra families, and beginning of the wildebeest migration. 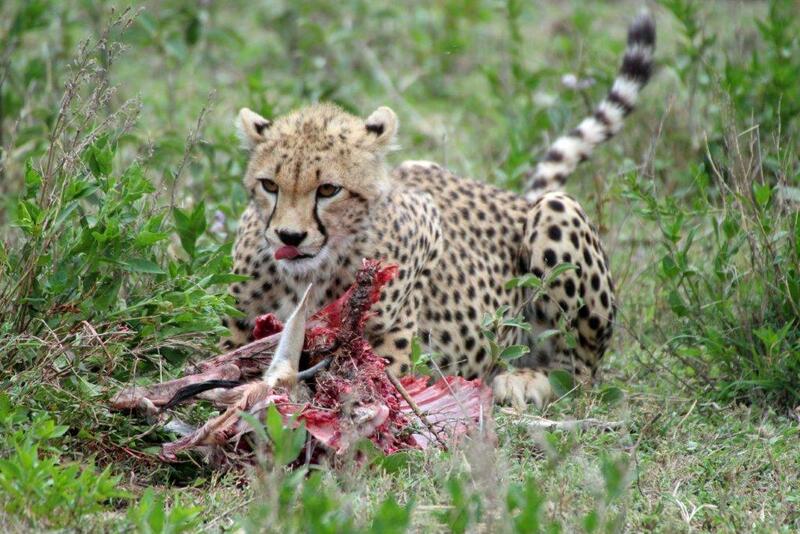 On our first day, a pair of cheetahs made a surprise raid on a warthog family, stealing one of the young. 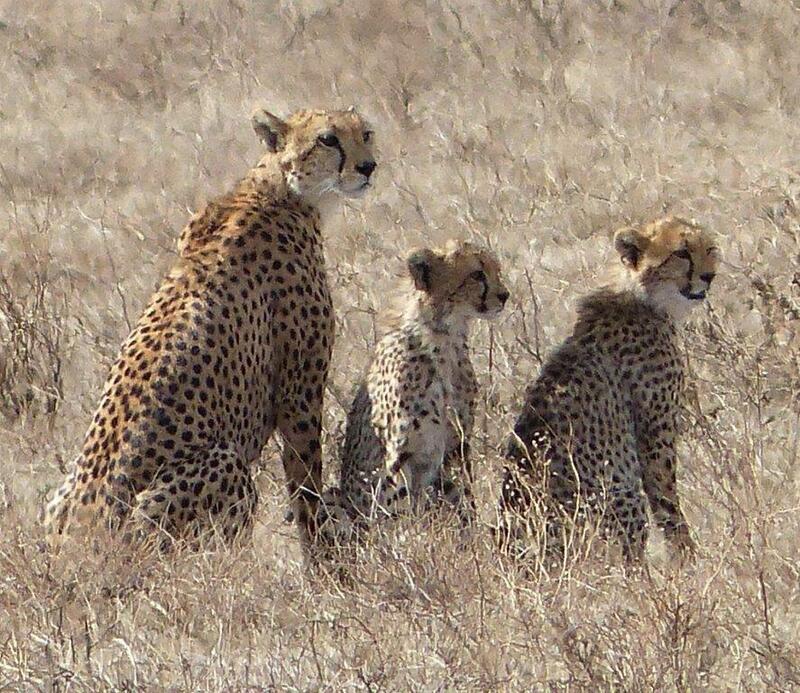 The distraught mother chased the other cheetah at an amazing pace. 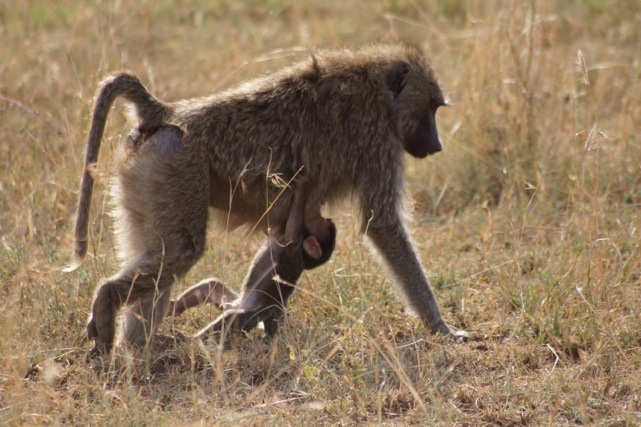 While watching a large group of baboons all around us, we spotted a male feasting on a small animal right next to us. 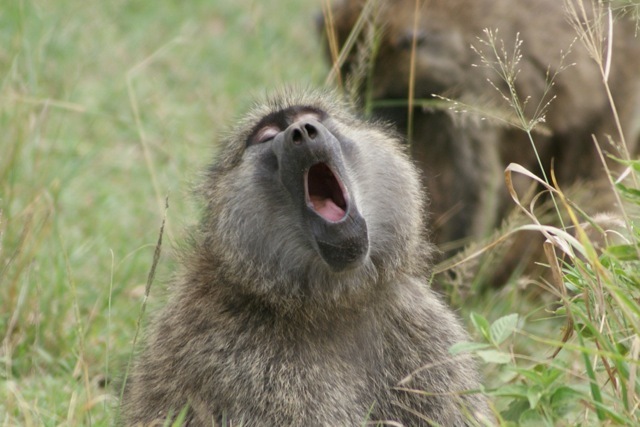 Our guide, David, said it was rare for baboons to eat meat so openly, but he sat at the side of the road picking the carcass clean. 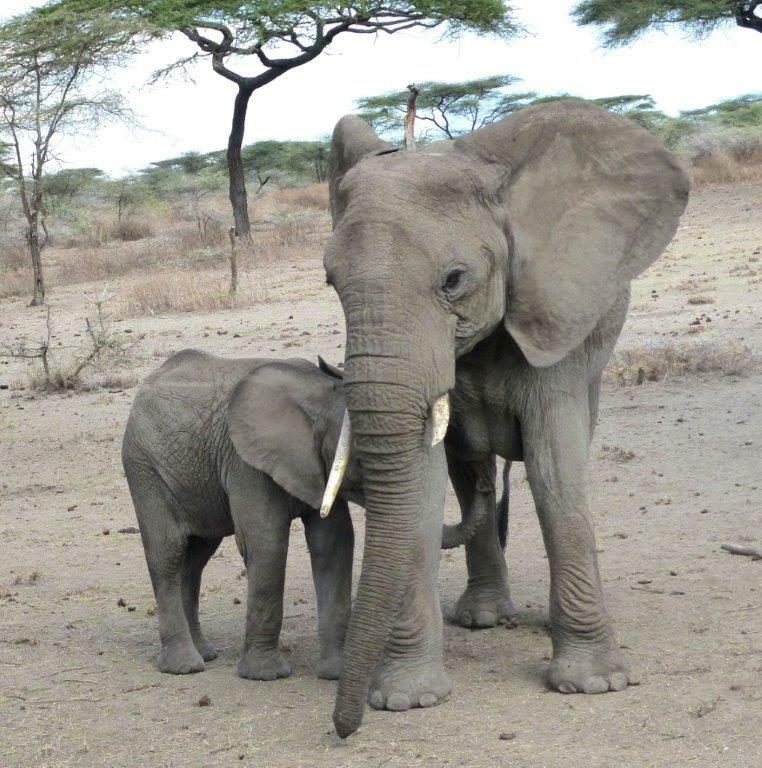 One elephant actually approached and circled our truck, stopping twice to let her infant nurse within a few feet of us, before ambling away. 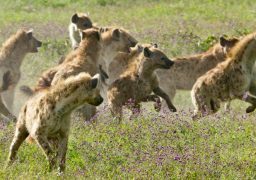 And we witnessed a large pack of hyenas try to approach a lion kill, only to be successfully driven off by 3 determined lionesses. 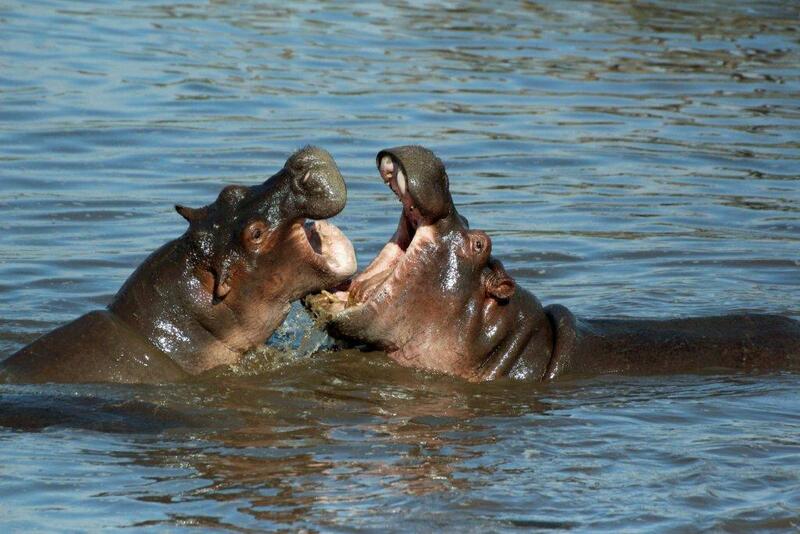 Two hippos appeared to clash repeatedly in the water with their mouths open, although no blood appeared. We witnesses real and novel adventures every day, not just a long distance peek at wildlife! 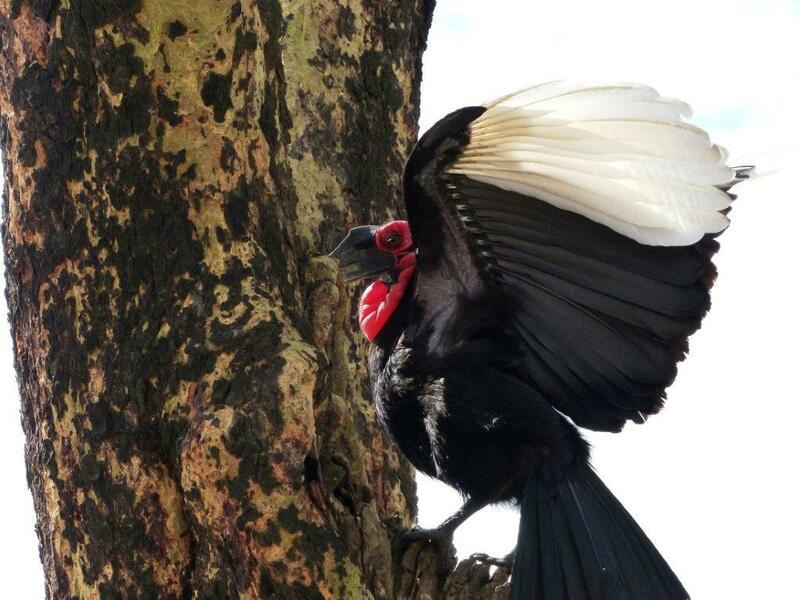 Also, Tanzania is a bird lover’s paradise, we was a wide variety of birds, including birds of prey, at close range. Some even landed on our vehicle. 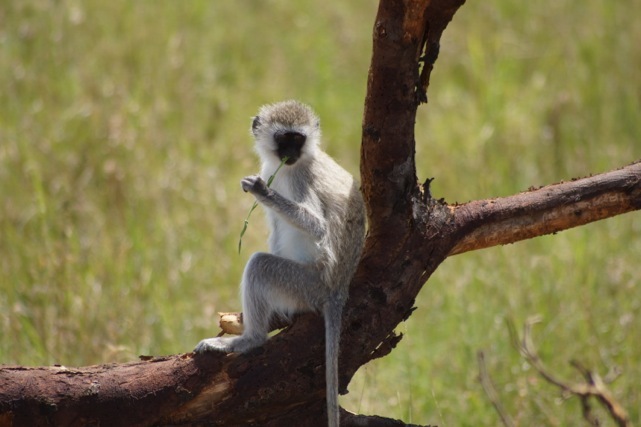 Our guide, David, was the best we have ever known, very knowledgeably responding to every inquiry imaginable (a young person in our group was especially eager for understanding of not only wildlife, but Tanzanian culture and customs). He saw wildlife with his naked eye that we had trouble locating with binoculars, and was a virtual encyclopedia of knowledge about every creature we saw – and we saw it all! Not only the big five, but dozens of smaller animals, lizards, and birds as well. He filled us in on every detail about the various acacia trees, the baobab and sausage trees, and gave us advice when we visited a Masaii village. We stayed a long time watching some animals and never felt rushed to move on, as long as one of us was standing. 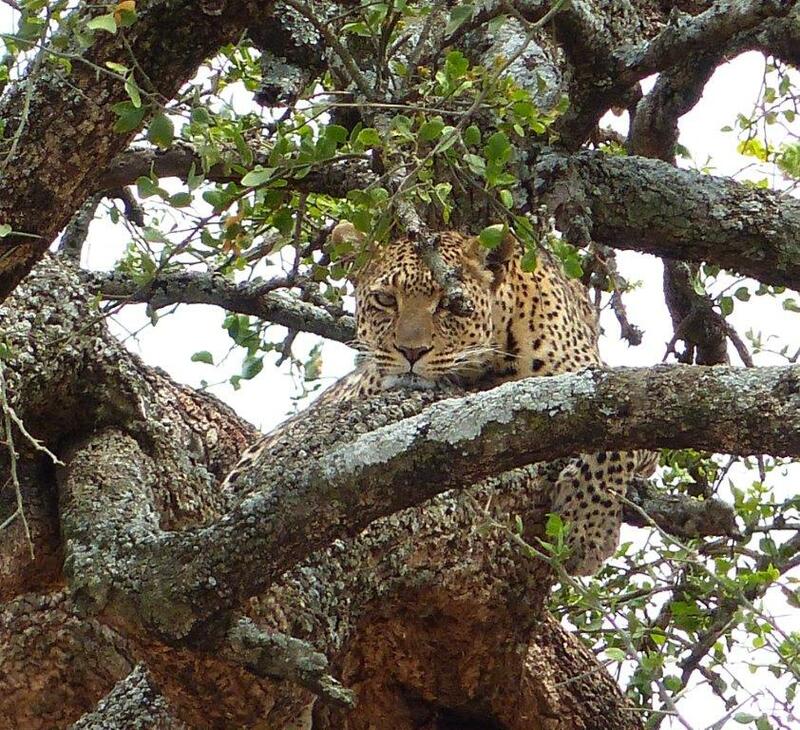 And he frequently moved us into a better viewing position as animals moved about, no request necessary. 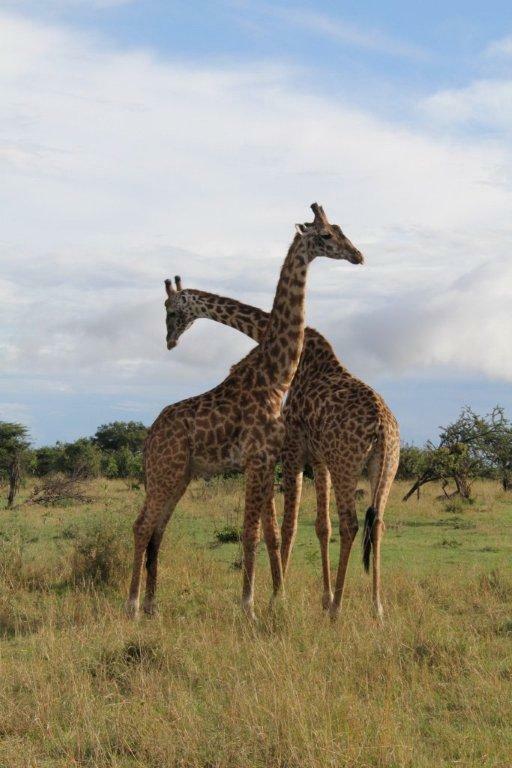 I would urge anyone interested in a Tanzanian safari to book with Africa Dream Safaris, which we will surely do when we return! I left for Tanzania expecting to get to spend an amazing vacation on safari, but what I didn’t know was that I would come home with a completely new perspective. Tanzania opened my eyes and changed me in so many ways. The experience was unreal. I have never been exposed to so much natural beauty and culture as I did in the 2 weeks I spent with African Dream Safaris. First off, our entire vacation was perfectly planned and stress free. Sharon, from the moment I stepped off the plane until our guides said goodbye to us at the airport on our last day, we didn’t have to worry about anything. Everyone we met on our trip was far beyond hospitable and happy to take care of us and answer all of our questions (I had a lot!). Our guide was the most wonderful, knowledgeable, friendly man and he became part of our “family”. Every place we stayed at was more beautiful and breath-taking than the one before. We traveled during the slower season, so each place we stayed at was peaceful. From tents on the ridge of the Ngorogoro crater, beautiful white houses overlooking a coffee plantation, luxurious tents on top of a kopi, to a 5-star hotel overlooking a watering hole… I could watch animals drink from a watering hole outside of my bathroom window while I took a bath or wake up in the morning to elephants rustling around outside my tent. 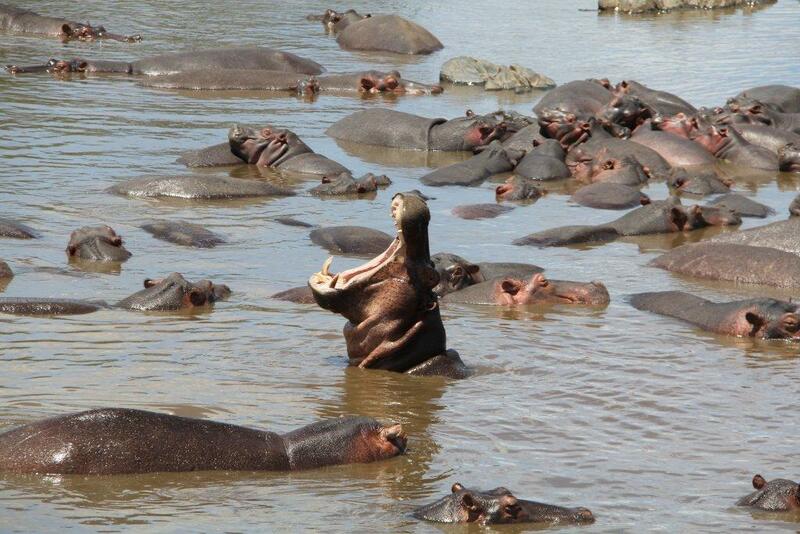 I could never have dreamed of how many animals we saw on our safari. To put it into perspective, in the first 20 minutes of our first drive, I asked our guide to stop so I could look at herd of gazelles out on the horizon. 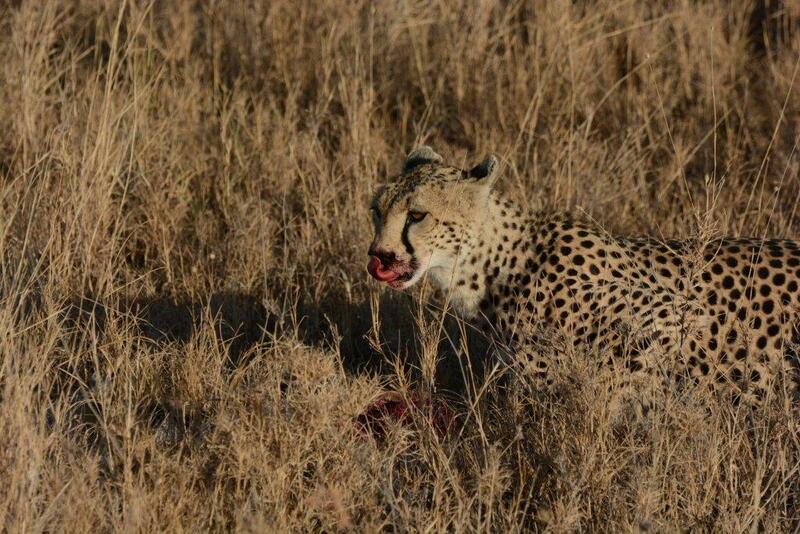 Later that day we got to experience the 2 cheetahs stalk and kill a baby warthog. Witnessing nature in action like that is something I will never forget. 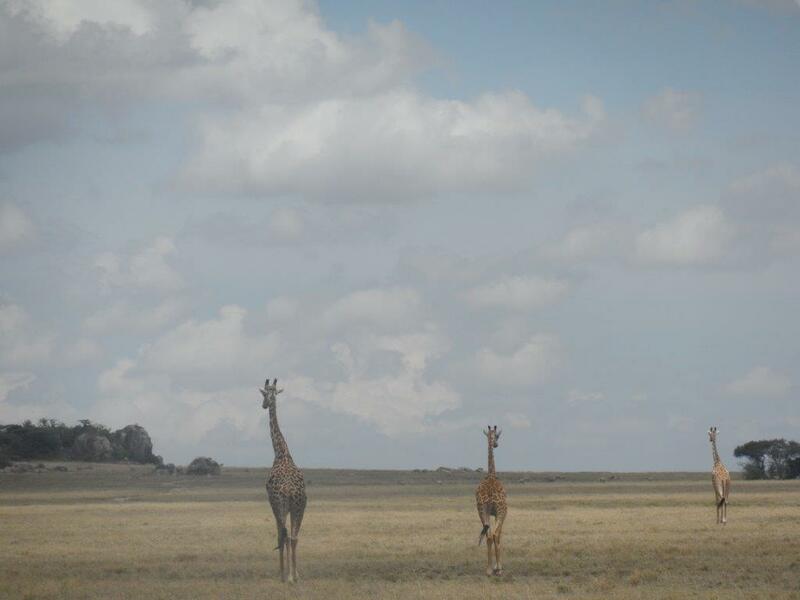 By the end of our safari seeing a family of giraffes up next to our car was normal. We saw every animal you could possibly imagine and then some. My personal favorites were the zebras. We saw thousands and thousands everywhere we went but they never stopped being fascinating and beautiful to me. 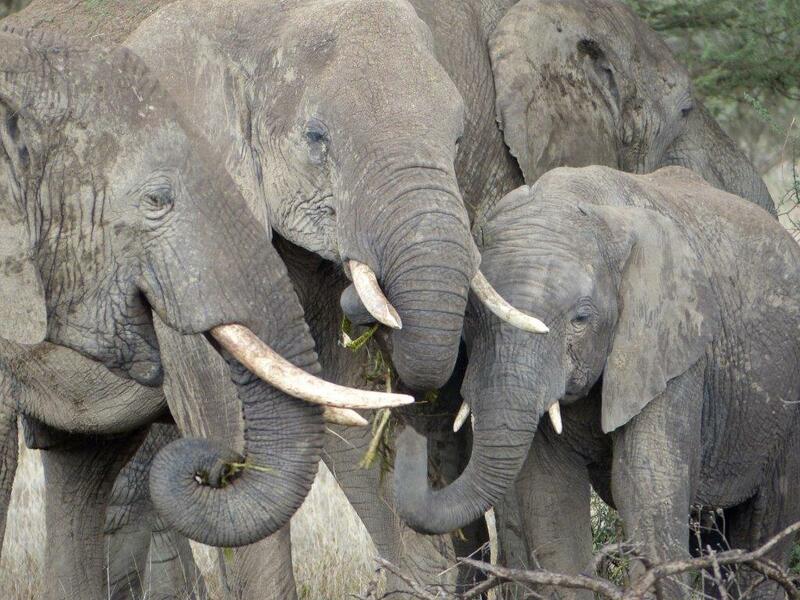 One of our last drives we stumbled upon over 200 elephants, surrounding and walking around our truck. You could see them for miles! We also got to see black rhino in the Ngorogoro crater, which was a real treat. Every day was another incredible adventure… One day we got to go on a peaceful hot air balloon safari and watch the sunrise. When we landed, we had a delicious and beautiful breakfast prepared for under a tree overlooking the mountains and herds of water buffalo. 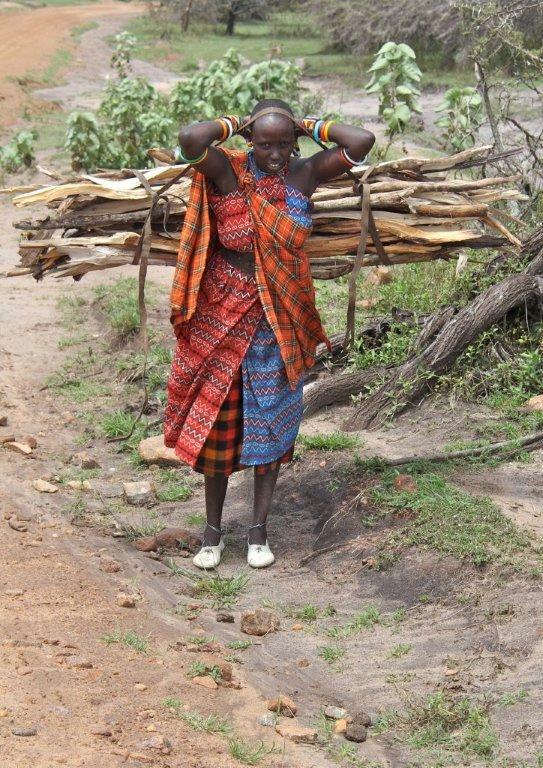 One day we spent time in a Masai village talking to and learning about their culture. I even got to learn how to do traditional Masai dances. Overall, I will look back on this trip as an experience that has completely changed my worldview. It was the most surreal, beautiful, humbling, educational, and incredible 2 weeks of my life. 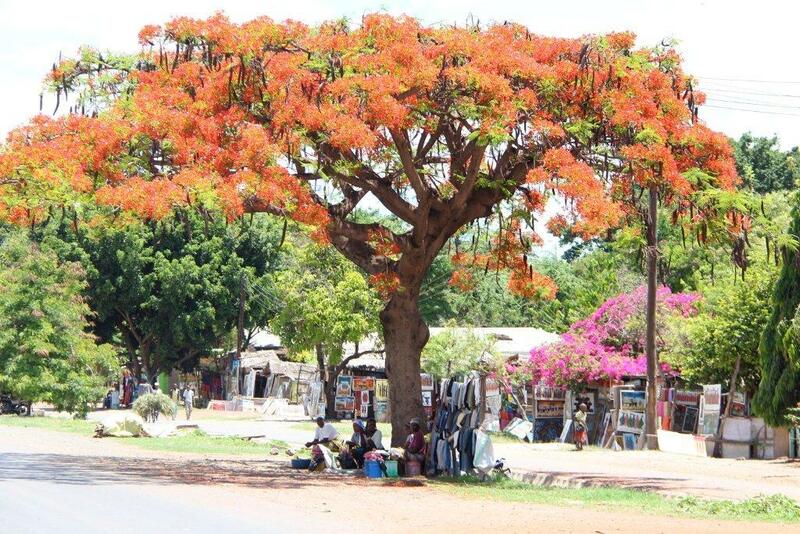 I have no doubt in my mind that I will come back to Tanzania someday. Aside from this, I can’t thank you enough for planning the this trip for us. Everything about it was perfect. I talk for hours on end when people ask me about my experience. I still can’t believe all the things I experienced and saw and did. I am only 19 years old, so it is kind of a problem because I have such a yearning to travel and experience other cultures and countries now. Thank you. Thank you. Thank you a million times. 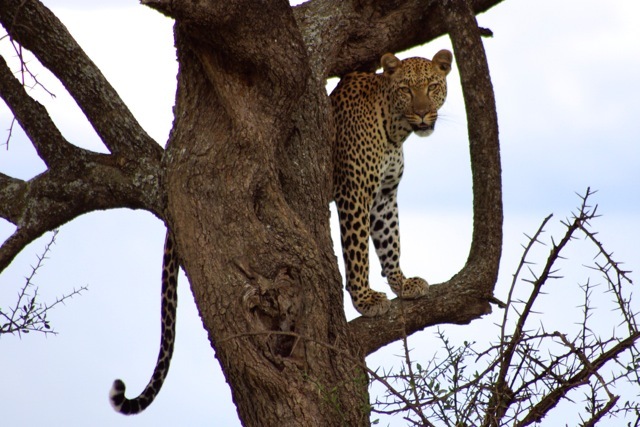 My experience, both in Tanzania and with African Dream Safaris, was absolutely incredible. My dreams of traveling to Africa began when I was a little girl, and I was extremely blessed to see them come true at only 18 years of age. Not only was I immediately impressed by the beauty of Tanzania when I stepped off the plane, but I was truly taken aback by the hospitality and friendliness of everyone from Africa Dream Safaris that we worked with throughout the entire trip. Our guide assigned to help us through the airport process and get us to our hotel was not only friendly, but also efficient. That was easily the quickest I have ever made it through customs, and definitely the most painless. Our trip out of the airport on our way back to the United States was equally enjoyable. Sharon, every place we stayed in was not only beautiful and comfortable, but also surrounded by wildlife. We could hear animals moving around outside during the night, and we would often spot their foot prints the next day. Not to mention the food! The food at every location was delicious and plentiful. 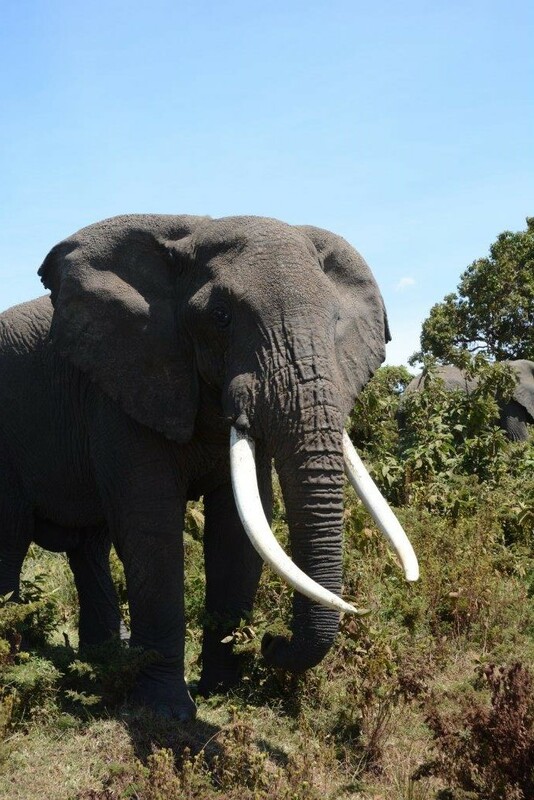 Our guide, David, truly helped us experience the wildlife around us to the fullest. He pointed out well-camoflauged animals, insects and birds that we never would have spotted otherwise. He also did an incredible job of manuevering the sometimes difficult roads, and taught us about local culture. We even learned some Swahili! 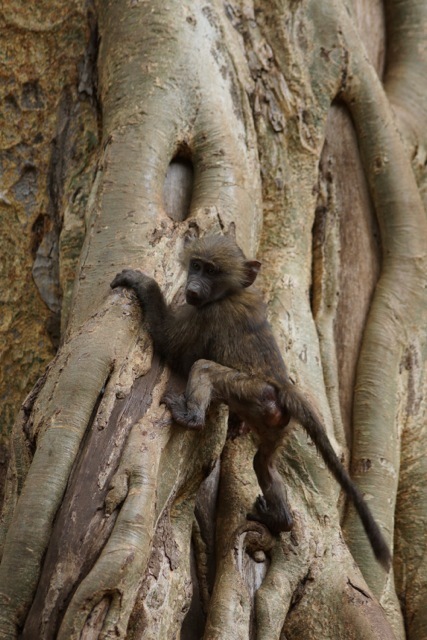 I saw every animal I could have imagined in Tanzania. 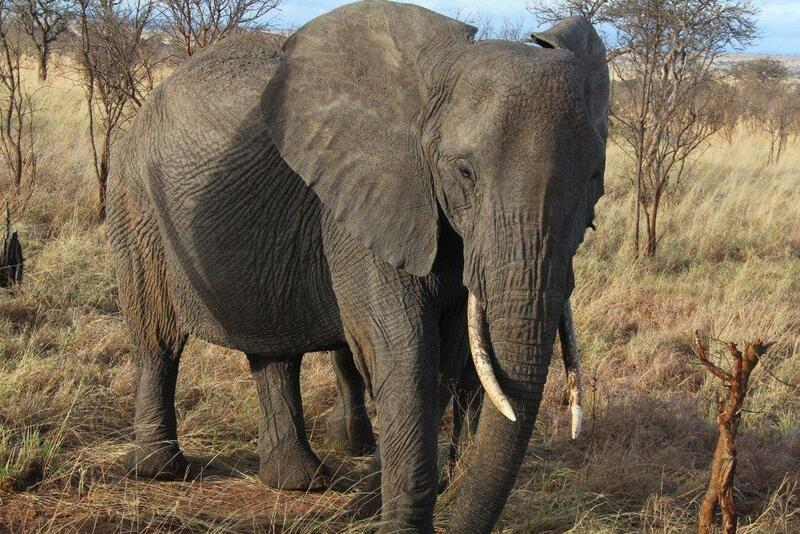 We saw hundreds of elephants, huge troupes of baboons, and even the rare black rhino–among countless other creatures! 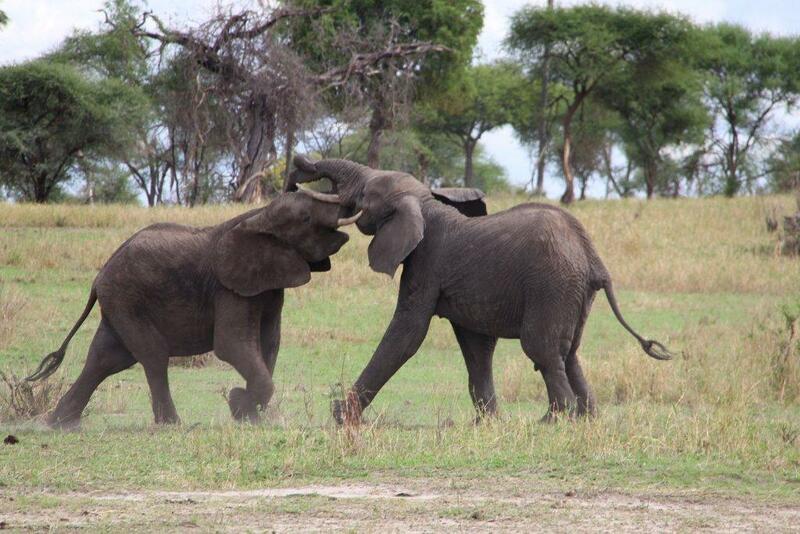 I wouldn’t change a thing about my experience in Tanzania with Africa Dream Safaris. 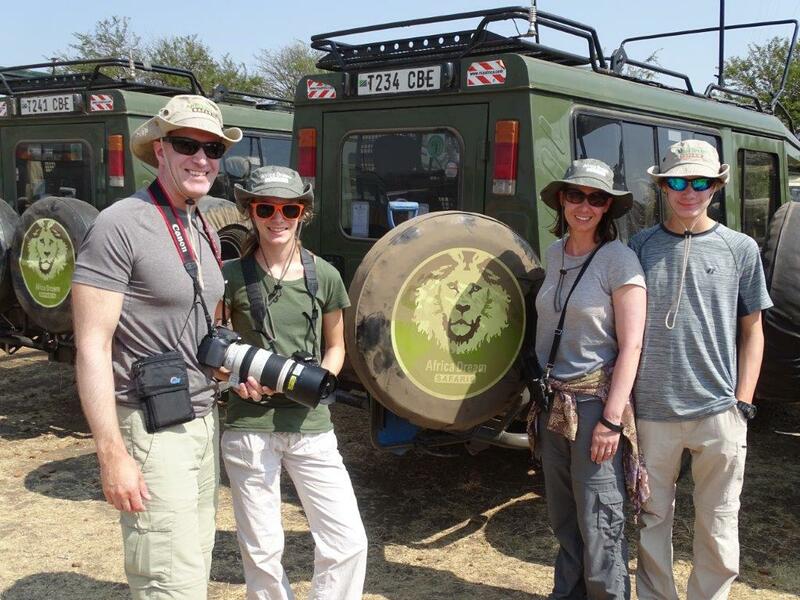 Not only will I be returning someday for another safari with this wonderful company, but I would recommend it to any family or friends who are interested in the adventure of a lifetime. 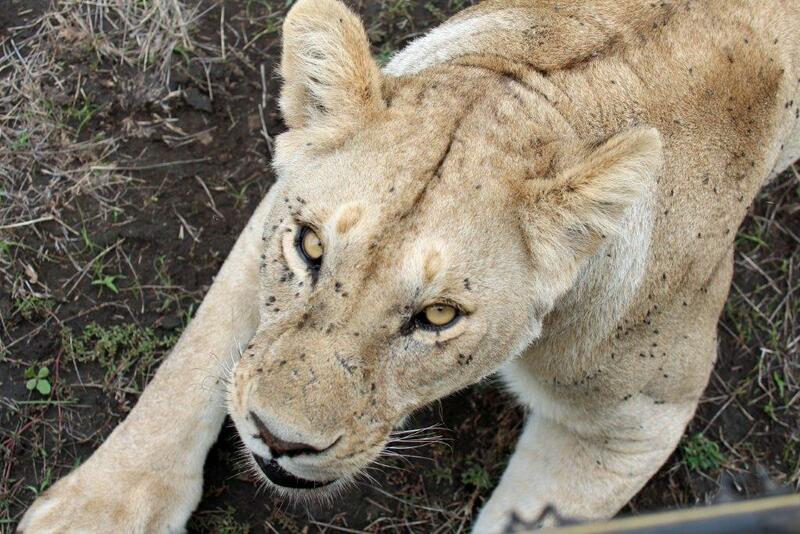 We had the most amazing safari imaginable! 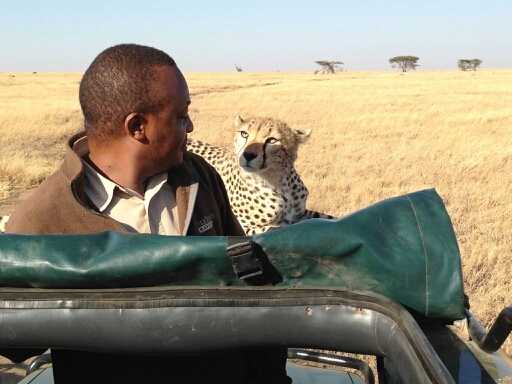 It wouldn’t have been the same without our guide Anglebert (pictured above with a friendly cheetah we encountered). 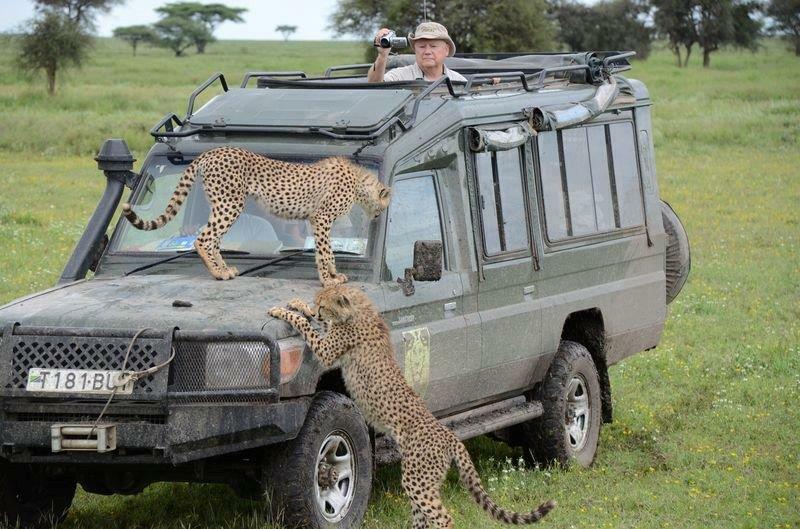 His timing was just right and he captured every opportunity to see and experience the animals in their natural habitats. 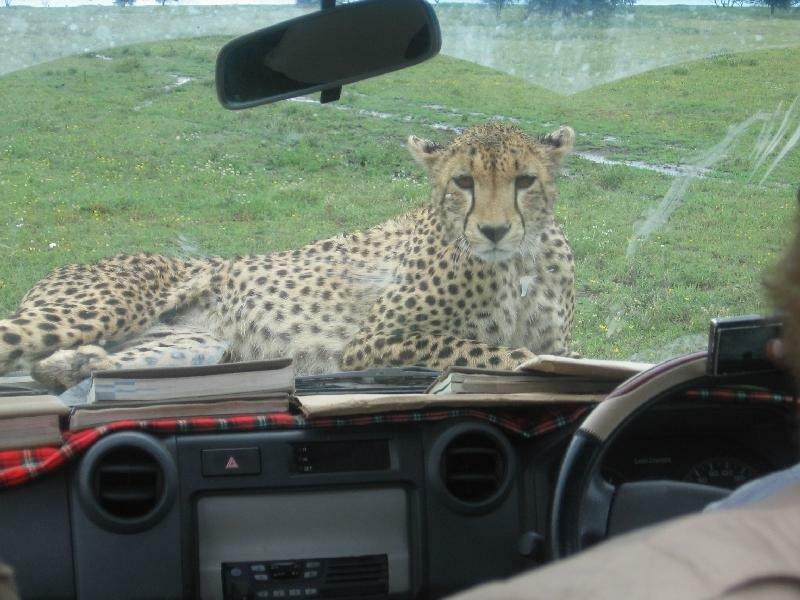 He enticed a cheetah to visit us in our car after eating its kill. At first we were scared, but then he explained that it wouldn’t hurt us. 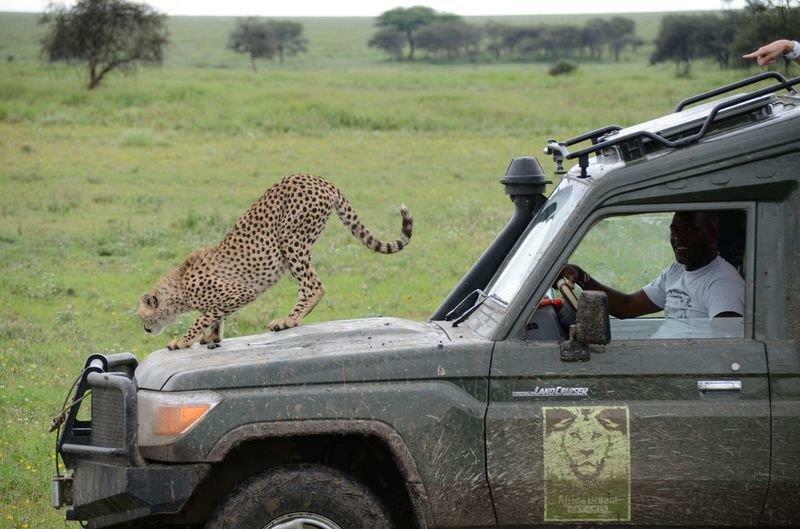 He knew how to manipulate the car just right and give the cheetah every opportunity to jump on. At first, it sat on the hood, looking at us through the front windshield as it showed us its teeth. Then, it began eating the antenna and canvass top. As it became more comfortable, he began exploring the entire car. As he began walking to the back, over the top, it almost slipped in. 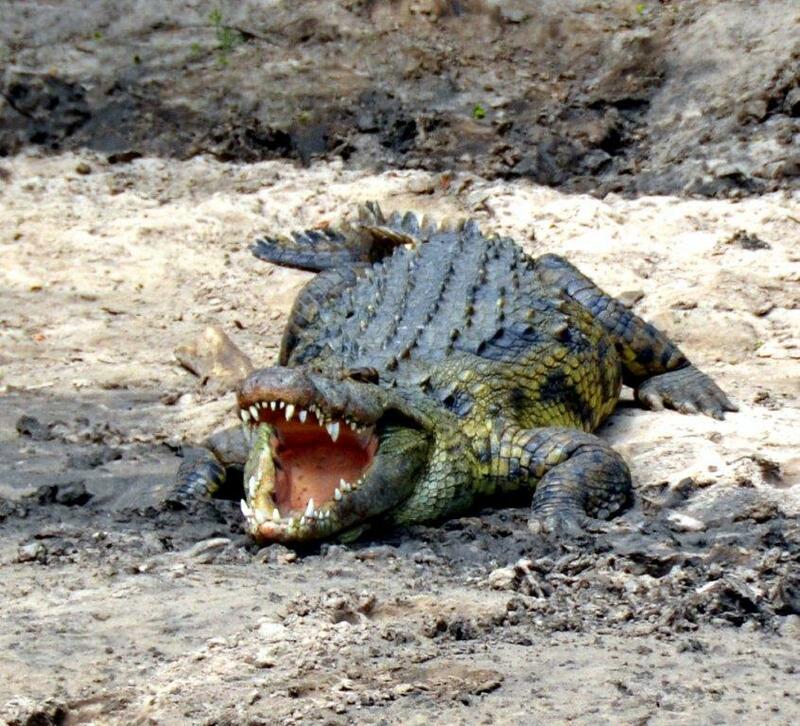 It came within inches of touching us and our guide. He stayed for about half an hour and it was one of the most exciting parts of our journey. 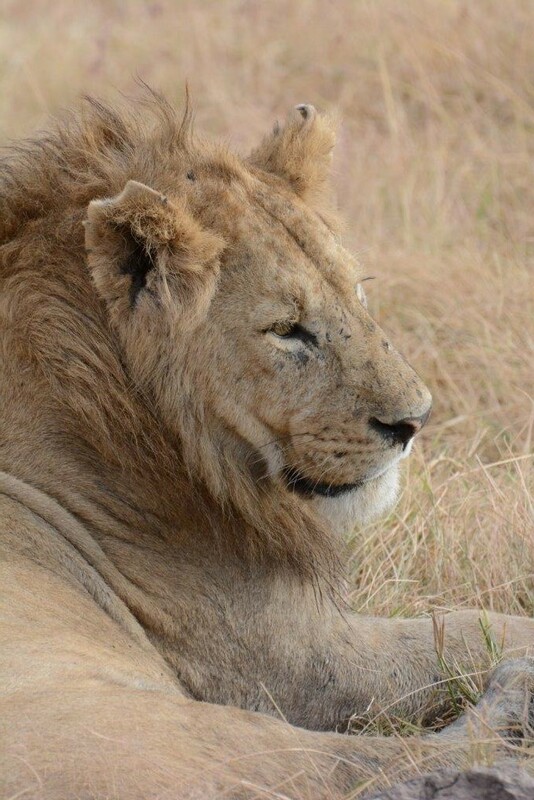 As we traveled through the Serengeti, we saw many animals enjoying their kills, lion’s mating, baby leopards in their den, a black rhino, and elephants standing right next to us. 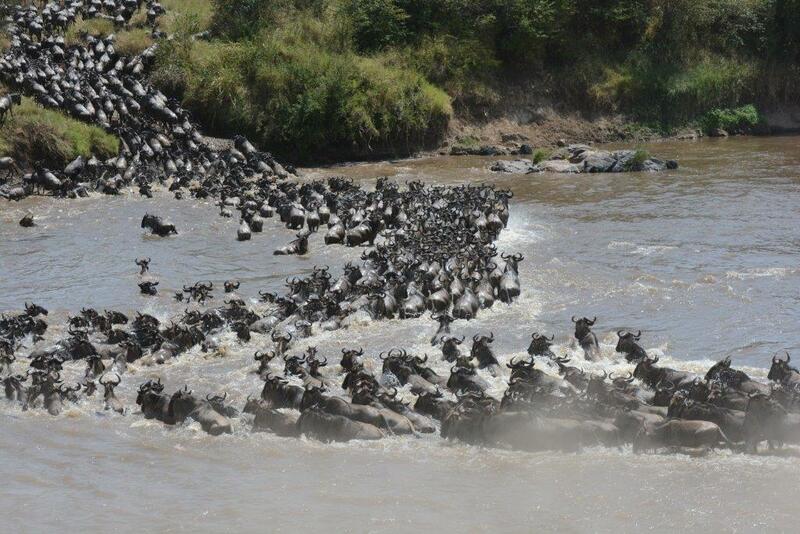 Another highlight was that we were lucky enough to see three river crossings as the wildebeests migrated across the Mara River. 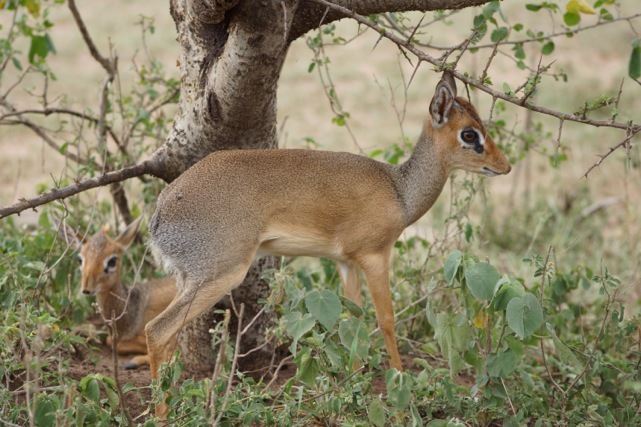 Our game drives lasted from early morning to dusk, which allowed us the best times to see the animals. We kept a list of every kind of animal we saw, and were amazed the Anglebert could identify every kind of bird, insect, and animal. He was respectful, thoughtful, and considerate of our needs. He even spoke with many of the chef’s at the different camps and provided us special meals. Through the combined efforts of Dawn, at ADS and Anglebert as our guide, the trip was fantastic and unforgettable! Marla G. and Lauren R.
Dave and I would like to thank you for organizing our trip of a lfetime to help us celebrate our 40th Wedding Anniversary. After more than a year of planning and reading the ADS newsletter and testimonials our expectations were high but thanks to you Dawn, ADS and Raphael Mollel they were highly exceeded. The Maasai necklace and warrior club were a pleasant surprise and one that we were honored to receive and will treasure always. The cake at the Mbuzi Mawe Tented Lodge and Plantation Lodge was very much appreciated and a special thank you for the upgrade to the Eucalyptus Suite at the Plantation Lodge. We throughly enjoyed all of our accommodations but the private luxury camp at Naabi Hill was outstanding!!!!!!!!!!!!!!! The staff was so attentive, friendly and welcoming. The meals were fantastic!!!!!!!!!!!!!!!! Can’t believe the freshness and the variety that was prepared in the bush. David had his dream come true on the first night there. 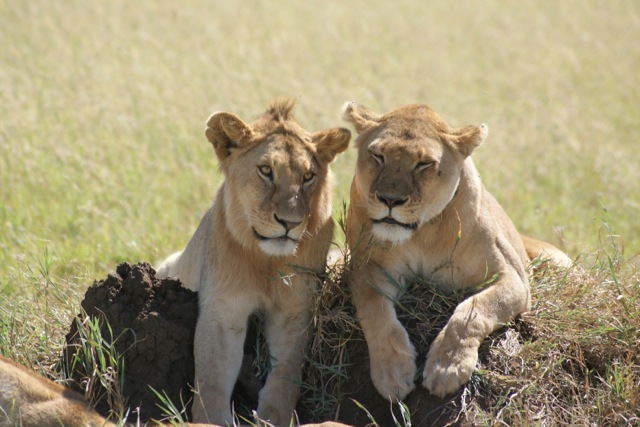 We heard the lions roar about 20 times and were told that there were 3 of them conversing about 100 yards away. Talk about your heart beating. Visiting in the green season was incredible so lush and the animals were active. 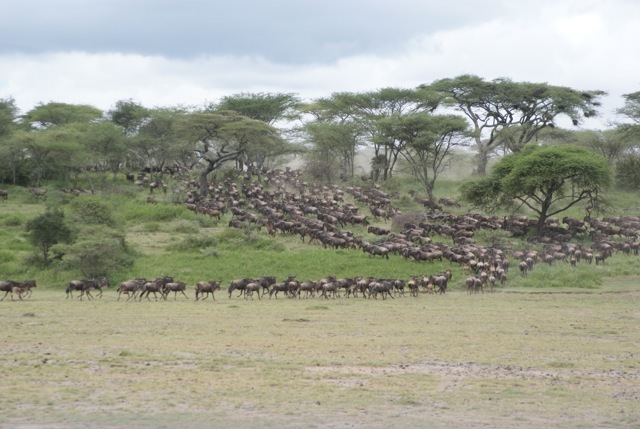 Being in the middle of the Great Migration was an experience we will never forget. 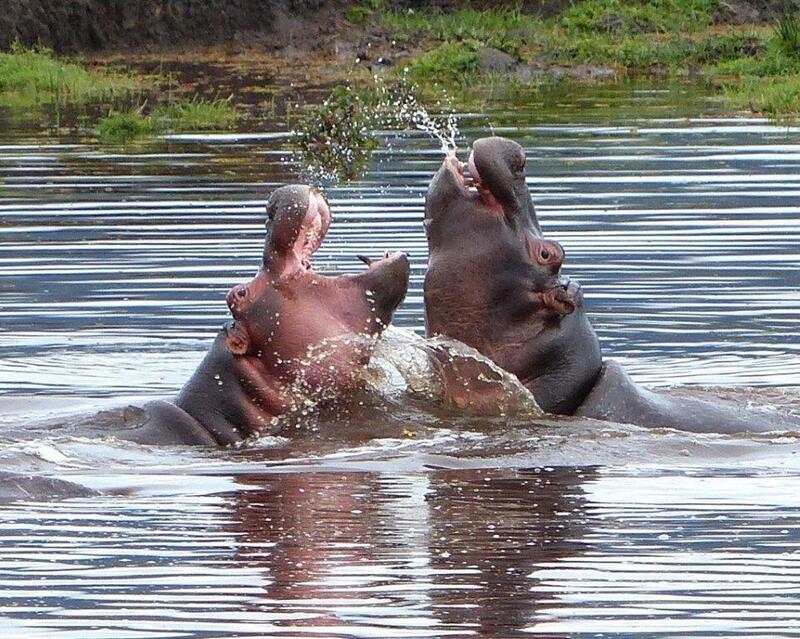 We did have a few showers every day but nothing to spoil our safari. Saw 92 lions 2 leopards (one up close and personal) and 18 cheetahs and of course all of the beautiful birds hippos, giraffes, grazers and monkies. The best experience was while we were in Ndutu. 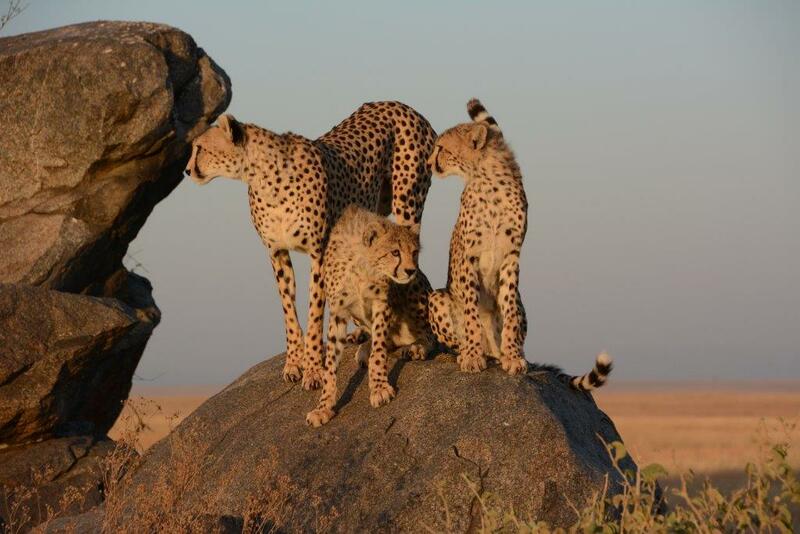 Raphael came across a mother cheetah and 3 cubs. They were chasing each other around a tree and then stopped and came toward us. OMG next thing one jumped on our hood then two were on our back tire and the fourth on the hood. This was the icing on the cake and my dreams came true. We were the only vehicle for about 20 minutes so we had them all to ourselves. I cannot say enough about Raphael. 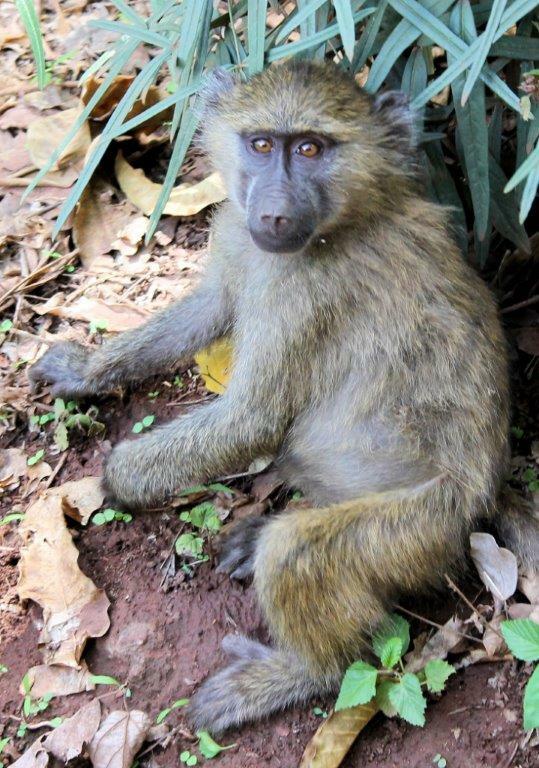 We hit it off the minute he met us at the airstrip. 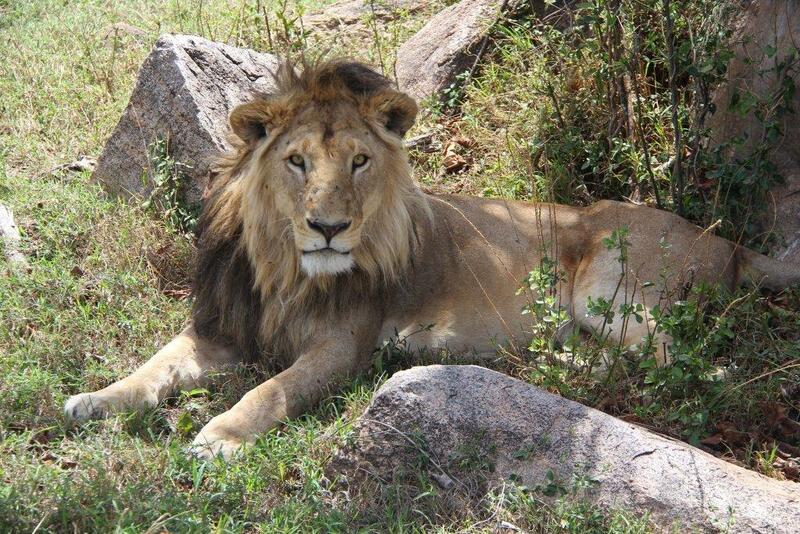 He was always friendly, courteous, professional and attentive to our expectations, needs and desires to see the animals. A skillful driver who always maneuvered us to the best position in viewing the animals. Most of the time we didn’t need to use our zoom. His eyesight was phenomenal in spotting the animals. Also his knowledge of the Serengeti, Crater, floral, fauna and Maasai was superior. ADS should be proud to have him as an employee and we highly recommend him as a driver/guide. We throughly enjoyed our hot air balloon ride. What a thrill!!!!!!!!!!!!!!! Well, better end as I can go on and on and on. 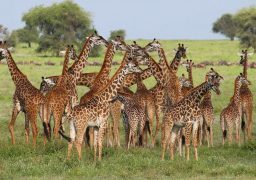 We would recommend Africa Dream Safaris to anyone. Thank you from the bottom of our hearts for making this dream come true. 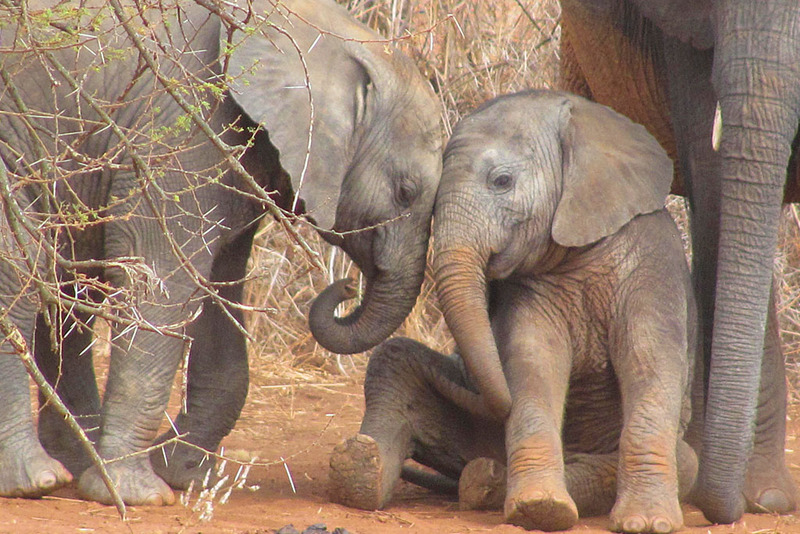 Africa Dream Safaris is aptly named-they made our Safari dream a reality! We talk about going places all the time, especially after hearing recollections of some of our friends’ amazing adventures, but those special trips are always what we will do some day. So, when I found myself sitting in our Land Rover in the Serengeti surrounded by wildebeests, zebras, and gazelles, I almost had to pinch myself to realize we really were on the Safari of our dreams! We were talking with friends of ours and we all wanted to do something big to celebrate turning 50. Going on a safari was on the top of the wish list. 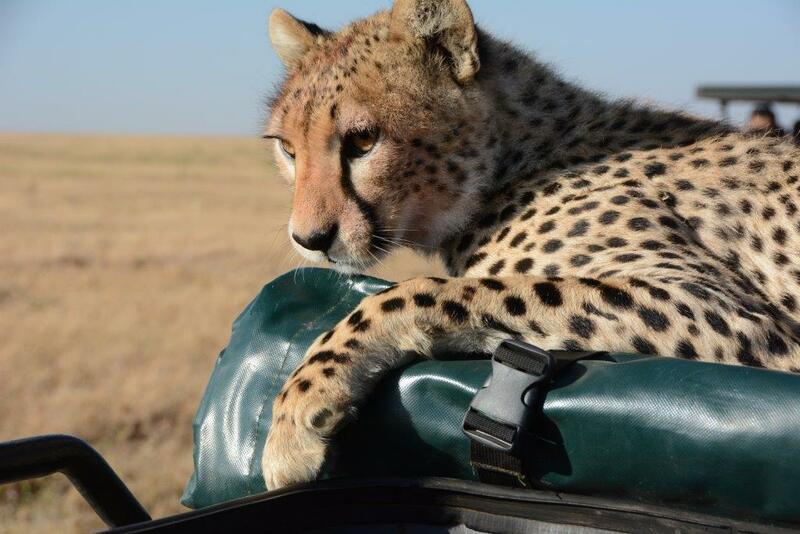 We said that we have friends who had spoken highly of their multiple safari experiences with ADS, so we decided this was the time to go and we contacted Sharon through the ADS website. 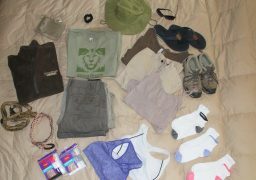 ADS gave us everything we needed to plan and pack for the trip. She helped us through the booking process, giving us updated detailed itineraries as we adjusted our dates. We packed our cameras, clothes, our ADS guidebook and boarded the plane. 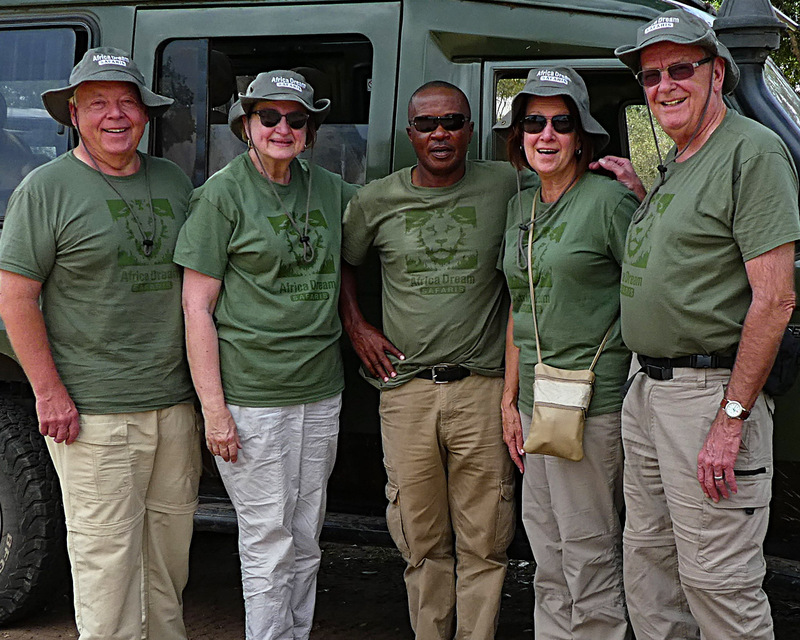 From the time we arrived in Kilimanjaro and were met at the airport to the time we said our final good byes to our guide, Francis, at the airport twelve days later, ADS staff was always prompt, professional, and handled every aspect of our trip smoothly. 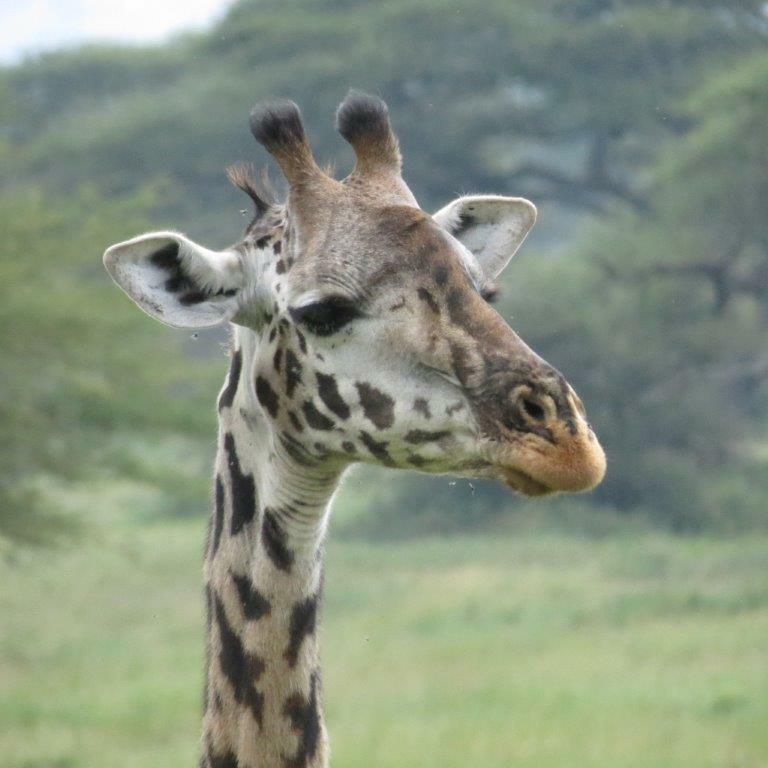 Our ADS guide, Francis, never failed to impress us with his amazing ability to spot animals and birds, his knowledge of the wildlife and the parks, and the uncanny ability to predict the weather! As we were starting our safari at the beginning of the wet season, Francis was preparing us for rainy weather, especially during the last week of our trip. This was the only time it turned out he was not correct! We were lucky that we only encountered rain twice for short periods and we were able to see lions playing in the mud and hyenas enjoying a mud spa. On every other matter, we could count on Francis to be an amazing wealth of knowledge. 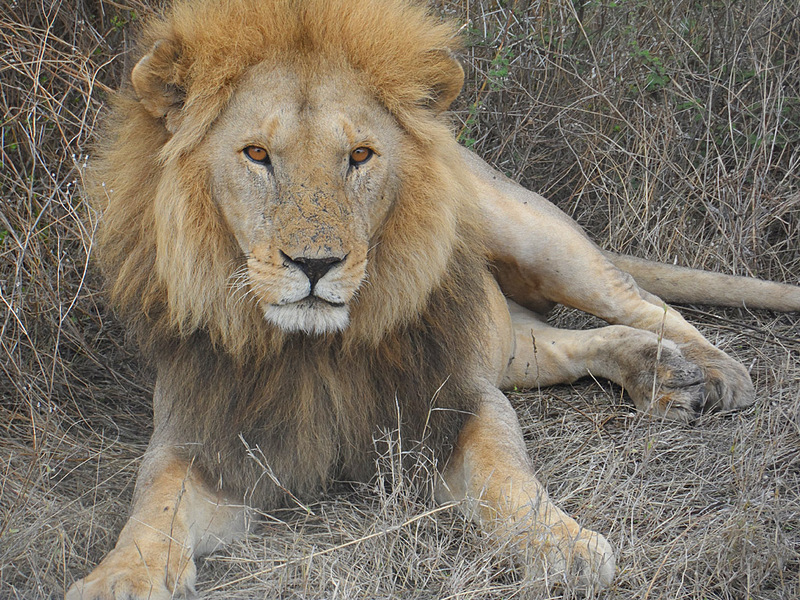 He could predict what a lion’s next move would be and identify every bird we encountered. Francis also shared aspects of life and the culture of Tanzania and efforts to preserve the parks. At the end of each day, we would agree on a plan for the next day. He made sure each day held new and exciting experiences. 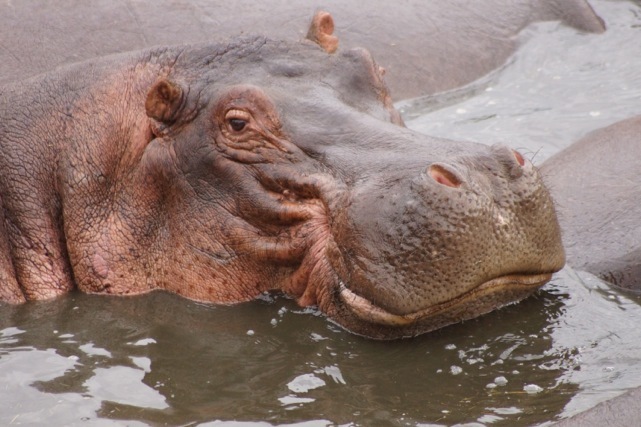 He even patiently waited while we lingered at the pungent hippo pool. We kept track in our ADS guide book and our ADS-recommended wildlife field guide book of all the birds and animals we encountered and it was quite an impressive list! 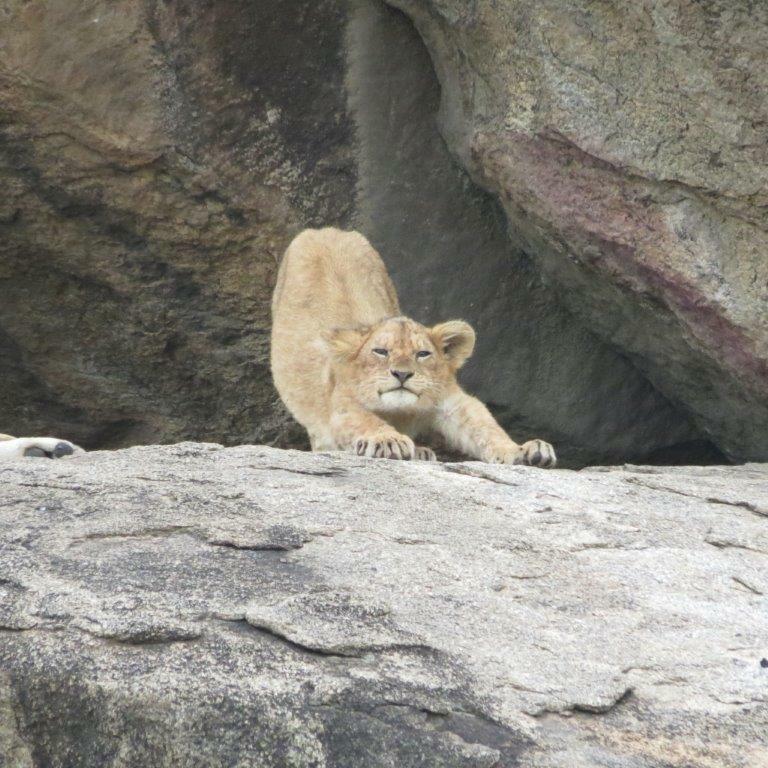 We watched a cheetah being herded away from the wildebeest calves by the adults, baboons playing in the trees, lions lounging on the beach and snacking on a fresh kill, elephants cooling themselves in the water, and so many other amazing encounters. It was great to have just the four of us and Francis to decide how long to stay and observe and take photos at each location. 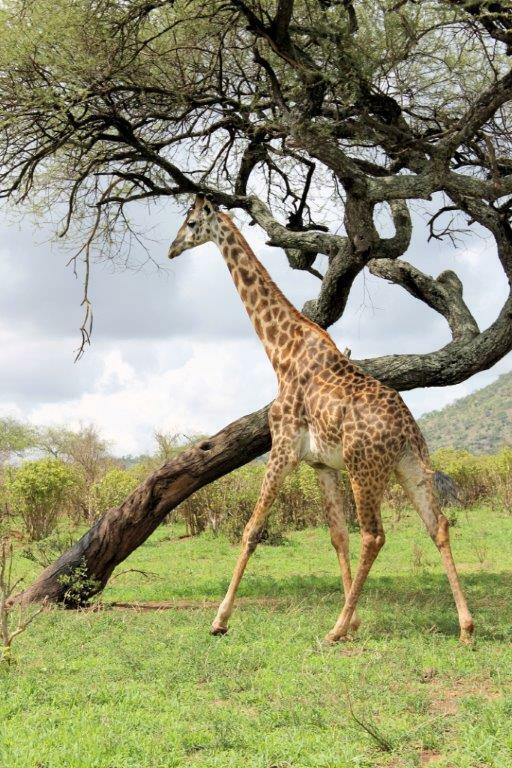 We traveled to the central Serengeti, southern Serengeti, the Ngorongoro Crater, Lake Manyara and and Tarangire. Even though the last night we stayed at the Kikoti Lodge we were the only guests, we were still treated to a full four-course delicious meal as at every other stop, which we were happy to share with Francis and celebrate an amazing trip. ADS is the best! I know this sounds contrite but the way they handled every aspect of our 12 days, was just outstanding! We booked with much excitement and as time got closer to the “big trip” our apprehensiveness rose. There was no reason to be apprehensive, because Dawn at African Dream Safaris had planned every detail to work out beautifully! Arrival in Arusha, being met right after coming off the plane, and being whisked though the passport/visa lines, was quick and efficient and impressive. Mt. Meru Hotel was fantastic and very hospitable and a great choice for beginning and ending our safari. The animals were fantastic, to say the least, but our driver, Omary seems to know exactly where to find them just by watching the birds in the air or the trees, or listening to the sounds of the zebra’s barking when they fear the lions in the area. We had a small rain storm come though daily, so we also want to comment on the muddy roads or paths that we traveled. Omary was a very careful driver and never got us stuck. He also was very attentive in cleaning the vehicle inside and out each night, so we started our adventure each morning in a nice, clean vehicle. We watched some drivers zoom by us and we appreciated his controlled speed and attentiveness so we didn’t miss the hidden animals. It made the trip more relaxing and we still had the option of telling him when to move on or stay longer. We can’t say enough about Omary’s knowledge and experience in the area of game driving. All the accommodations we stayed in were wonderful, but the very best was the “Kusini Tented Lodge”. The staff, food and accommodations were fantastic. We especially loved the wonderful evening drinks and social on the “welcome rocks”. The overstuffed bean bags to rest upon and appetizers being served while watching the sunset after a day of seafaring, was just fantastic. We loved the high standards that managers, Deb and Chris, from the UK, provide to all their guests. Each meal was served on beautiful white china from England and the food was just outstanding! We wished we would have had a 3rd night to enjoy there before moving on to the Ngorongoro Crater. Our 2nd favorite lodge, was without a doubt the “Manor at Ngorongoro”, which has wonderfully appointed individual guest cottages and beautiful horse stables. We also wished we could of added a day there to tour the coffee plantations by horseback. We can honestly say without a doubt, this was a fantastic adventure! You hear so often the negatives of the world but Africa Dream Safaris was truly a wonderful organization to travel with in every way!! Thanks again to Dawn of ADS , Omary our driver and the rest of the camp staffs for a fantastic memory making trip. The trip and experience of a lifetime is how we have been describing our recent safari in gorgeous Tanzania with Africa Dream Safaris. Each day was a new adventure with Anglebert our driver/ guide. 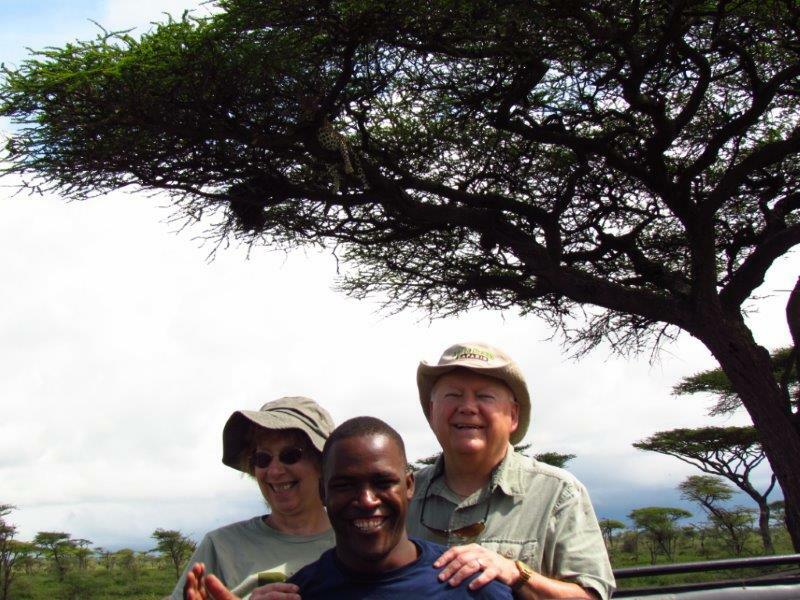 Not only was he extremely knowledgeable about the animals and birds, the history and culture of Tanzania, but he was also skilled at reading animal behavior and predicting what they might do next, affording us opportunity for wonderful viewing and photography. 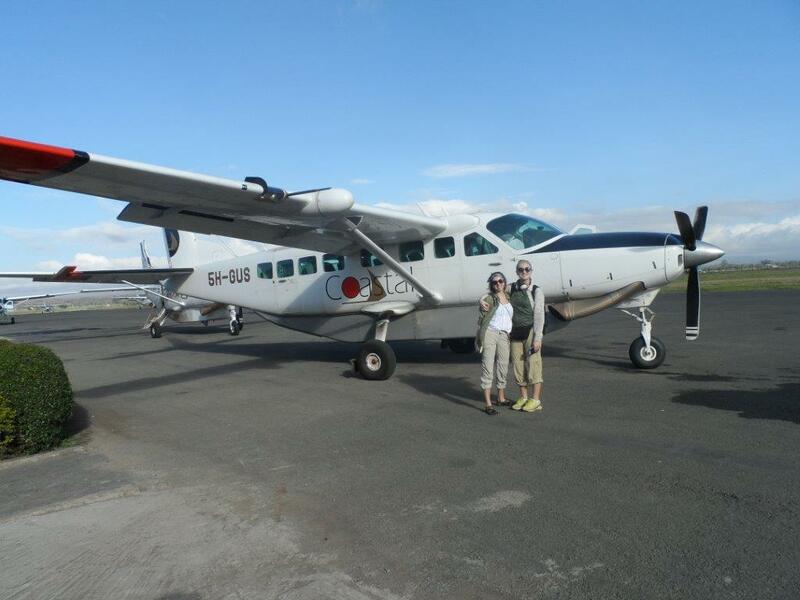 Our safari with ADS started on Nov. 1, 2012 in the Northern Serengeti after a short flight from Arusha. 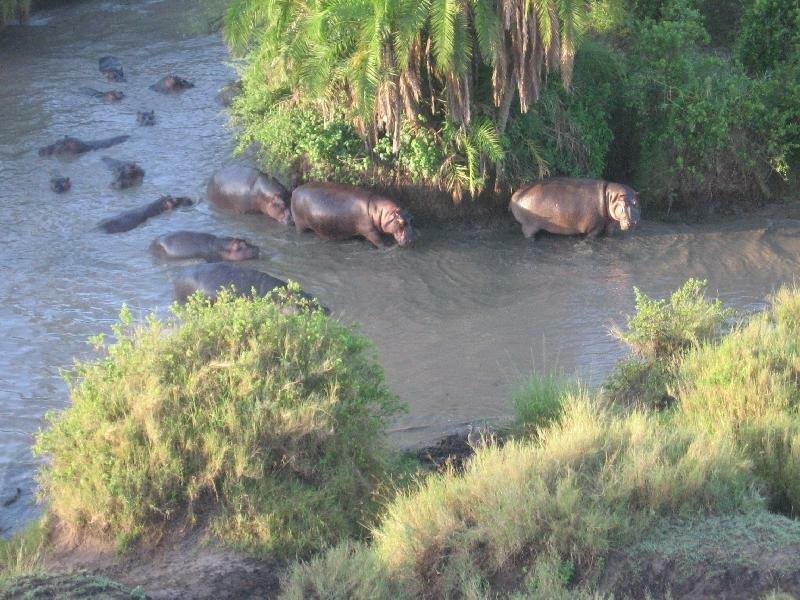 Even from the air we could we could see herds of zebra, wildebeest, elephants, and Cape buffalo. Within hours of meeting Angelbert at the Kogatende airstrip we were fortunate to see a herd of wildebeest crossing the Mara River as a lioness waited in the thickets on the other side. 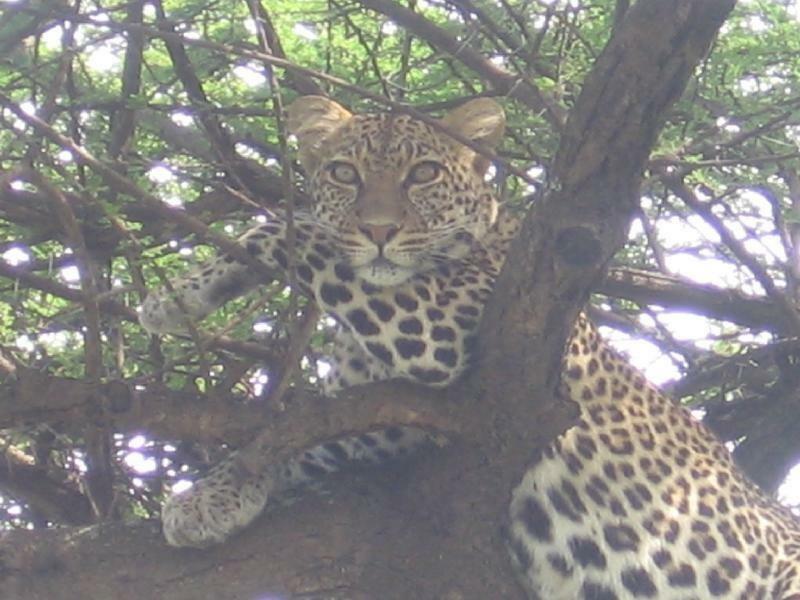 We found her later in a thicket with one of her kills. 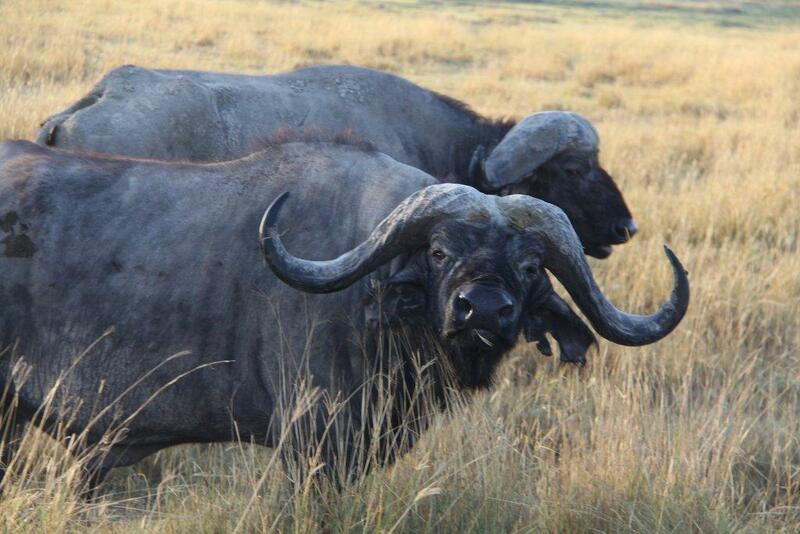 Our first two nights stay were at Buffalo Springs tented camp where we received a warm welcome. The staff made us feel at home and protected, and we loved waking up each morning to a “ good morning” with coffee and hot chocolate being brought to our tent before we left for an early morning game drive. The “tents” here were very deluxe. Ours had a leather loveseat and chair, a king size, beautifully furnished bed, and a tiled bathroom complete with all the amenities. The next morning we went to a Masai Boma where we were given a guided tour of the Boma and were instructed in Masai culture. Our time there ended with the men and women dancing and singing for us. That evening we took a night game drive starting in the late afternoon. The wildlife was particularly abundant here. 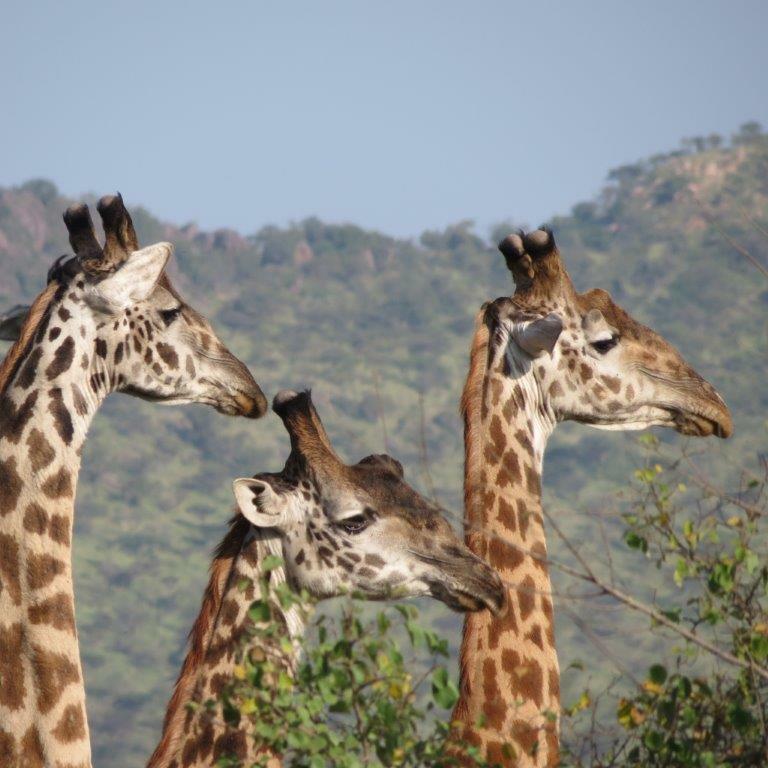 We saw a herd of 24 giraffe, a pride of 22 lions, Thompson gazelle, Topi, Eland, Reedbuck, Water Buck, Elephant, Mongoose, Baboon, Vervet monkey and a large herd of Cape buffalo, which thankfully were on the other side of a narrow deep ravine, as they looked ready to charge our vehicle. 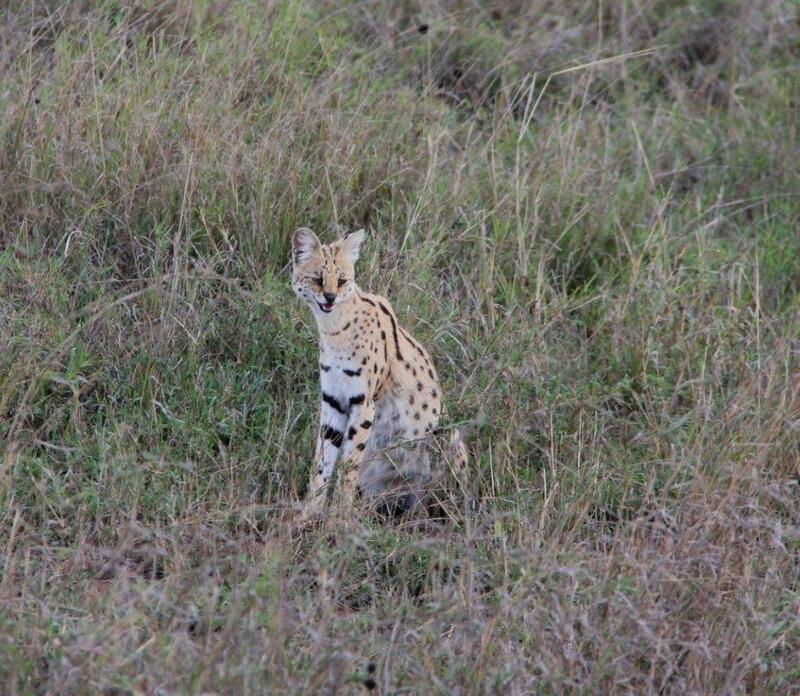 We also saw our first Serval Cat, and a pack of five Wild Dogs. We chose to take a walking safari at Buffalo Springs too. 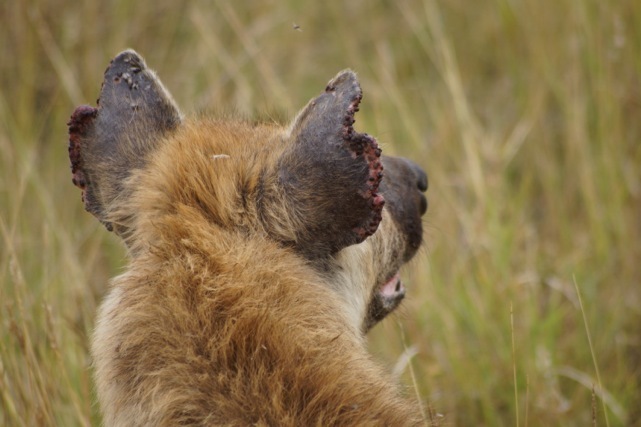 It was a little unnerving walking in places where we had seen wild game even though we had two Masai warriors with us in addition to our guide Moses. He was very knowledgeable in the animals, plants and birds we came across. We even got to watch a pair of Dung Beetles rolling their dung ball and then burying it. While game driving here we came upon two poachers late in the afternoon who had killed an eland. Angelbert reported it to the park rangers, who came promptly to check it out. November 4 we game drove in the Loliondo and Lobo Valley area. 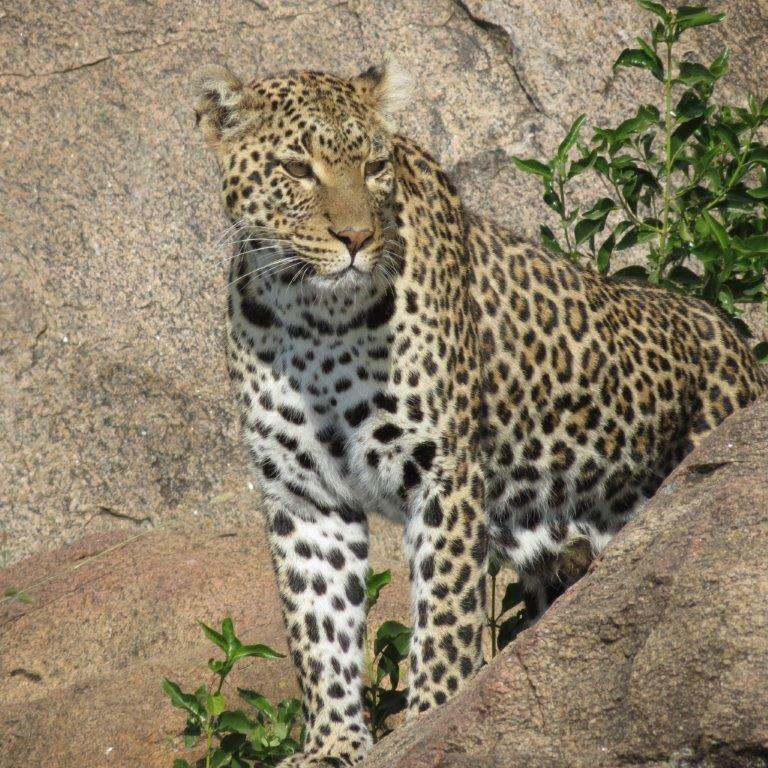 One of our first sightings of the morning was a leopard who walked out from under a small bridge we were crossing. 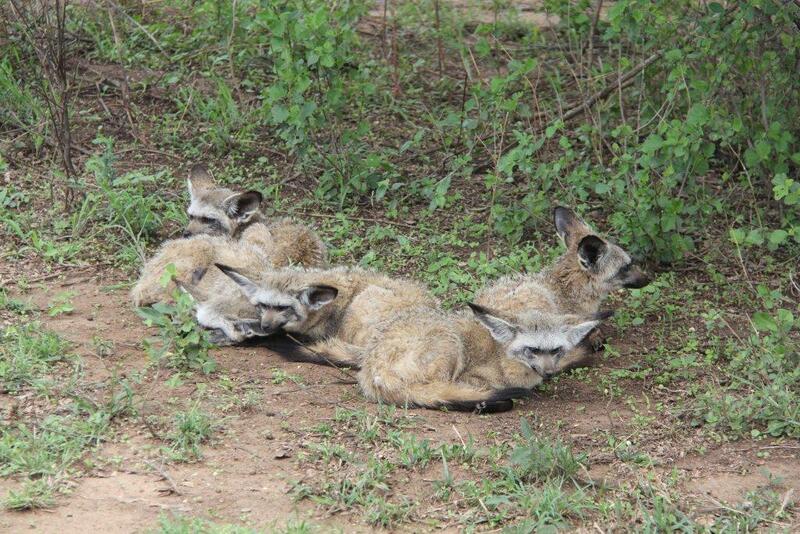 Later that morning we saw Cheetah, Ostrich, and Bat Eared Fox. 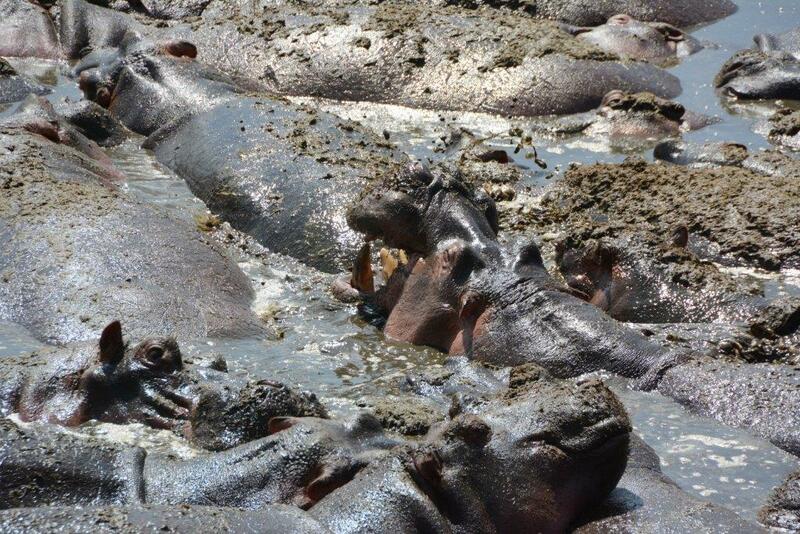 We visited the Retima Hippo Pool, and though we had seen hippos in the rivers we had been near, we had never imagined or seen such a huge number of Hippos in one place. 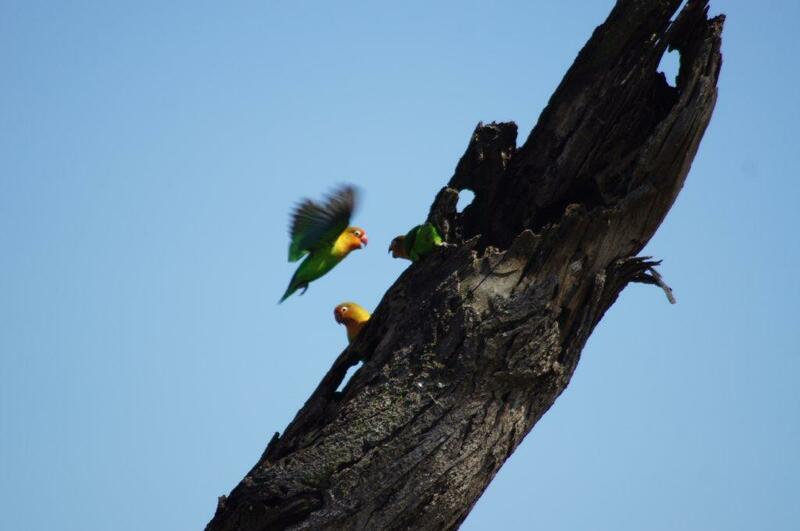 It was fascinating to watch them and the area lent itself to great photo opportunities. Later as we ate our boxed lunches Angelbert introduced us to Tangeweezi, a soft drink that tasted like a combination of Mountain Dew and Ginger ale. We really enjoyed it. 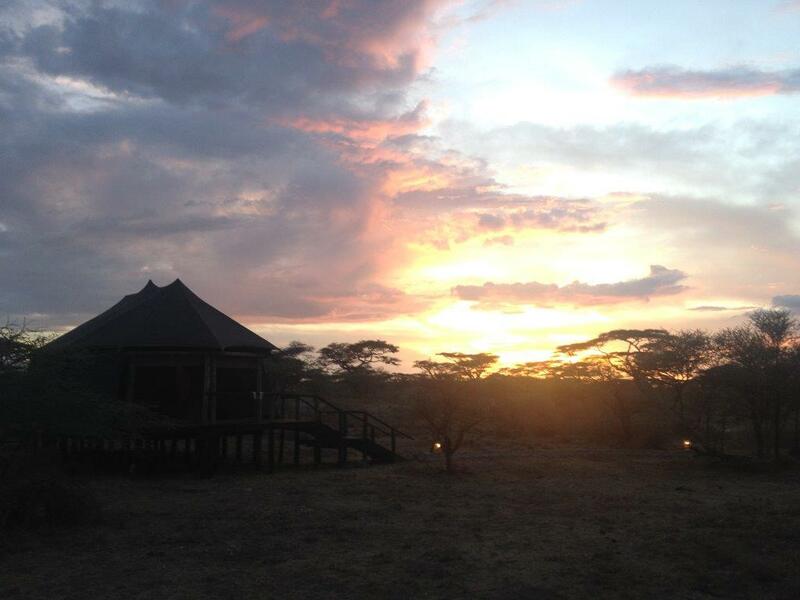 Our next two nights we stayed at Seronera Sametu tented camp. Jonas, one of the staff, greeted us each time we arrived at camp with hot moist towels, fresh mango juice, and his beautiful smile. Once again our tent accommodations were amazing and comfortable. Had it not been for mosquito netting around our bed and the sounds of lions, and hyena in the night, we would have thought we were in a resort hotel somewhere. The next morning we ate our breakfast in the Land Rover as we watched a mother cheetah and her 5-month-old cubs eating their breakfast of gazelle. 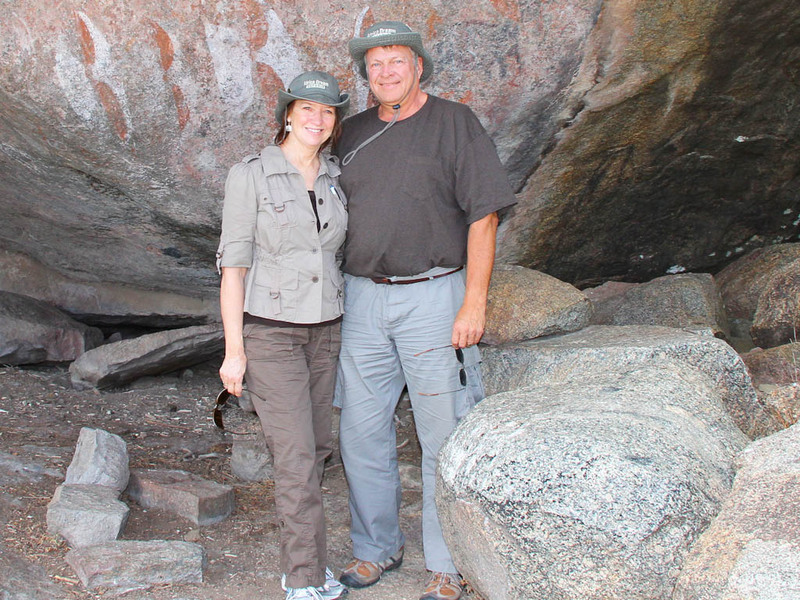 Throughout the day we toured many of the kopjes. We climbed one to see the Masai drawings on the rocks. 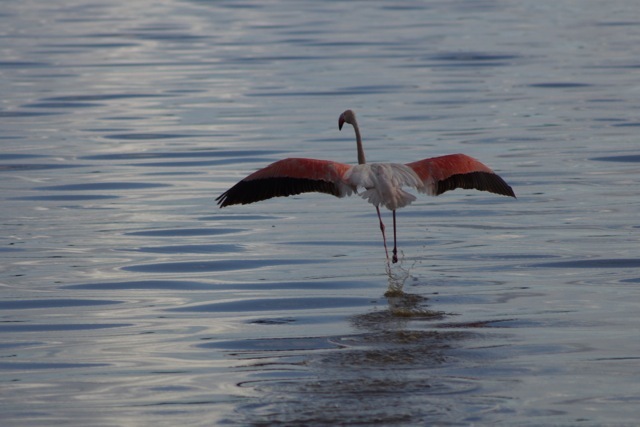 Later at Lake Magati we saw innumerable flamingo. We later saw a large herd of wildebeest thundering across the plain and stopped a while to watch them. 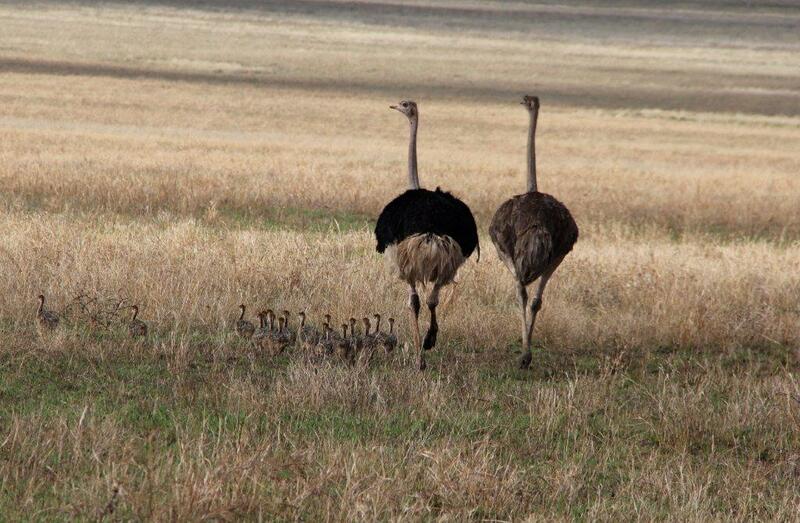 Angelbert positioned us so that they were running at us. 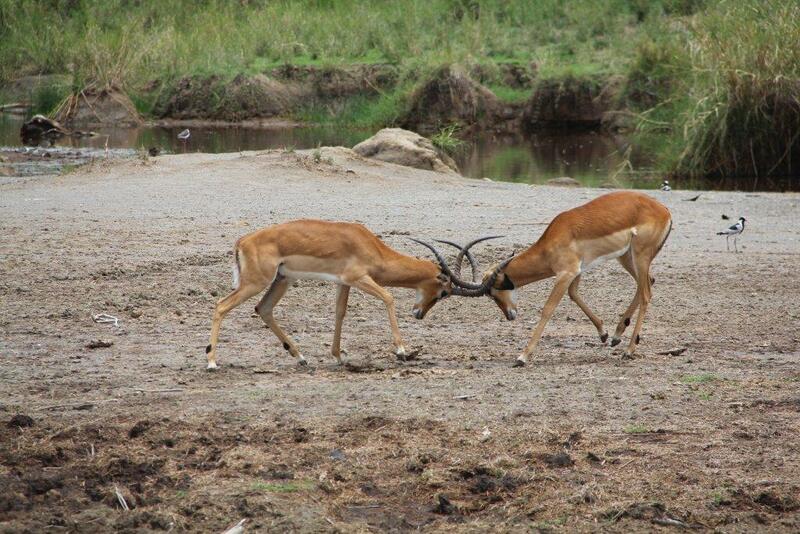 For added entertainment, two young impala bucks fought each other nearby. 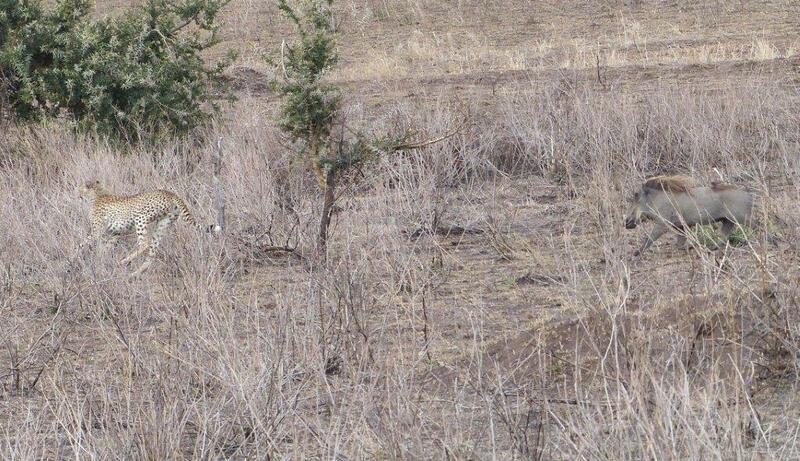 We had planned to go back to camp early today as we were both quite tired, but we were so glad we didn’t when we saw two male cheetahs that had spotted each other from afar. 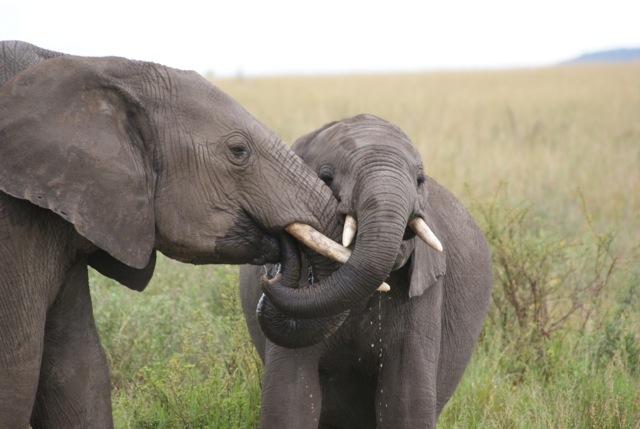 As they approached each other they recognized that they were brothers and nuzzled each other. 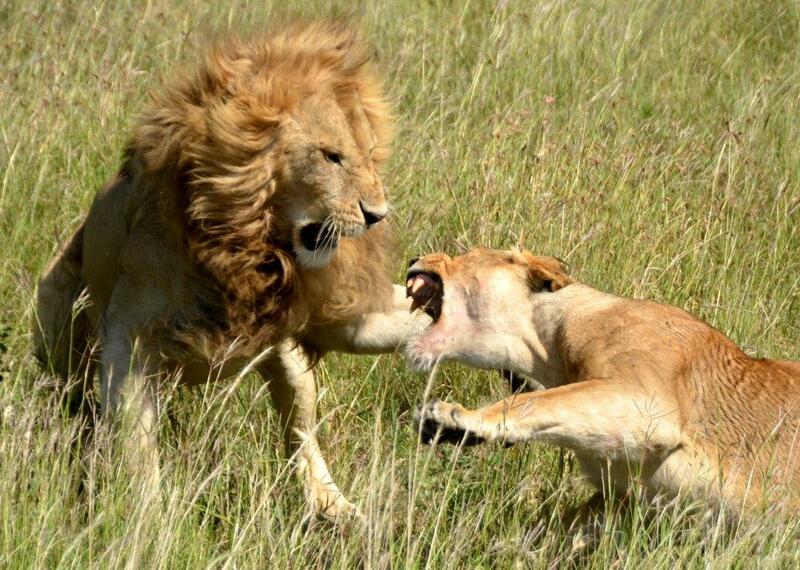 Shortly after, Angelbert spotted 3 female lion stalking a herd of wildebeest. One charged too soon and the wildebeest got away. 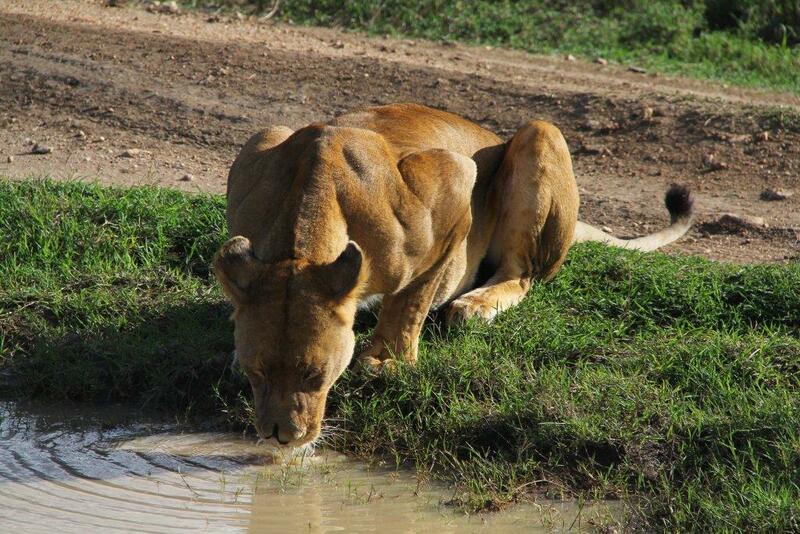 We followed one of the lionesses as she tiredly walked the road next to our Land Rover and stopped to drink heavily from a rain puddle. Jonas’ lion stories at supper that night we pretty frightening and as he walked us to our tent that night we could hear lions! 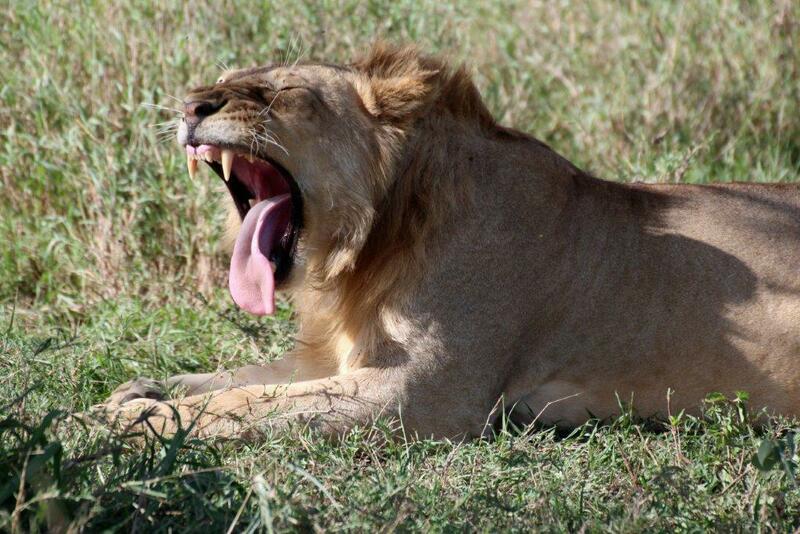 November 6 we started our game drive today at 6:30am and headed for the Southern Serengeti. 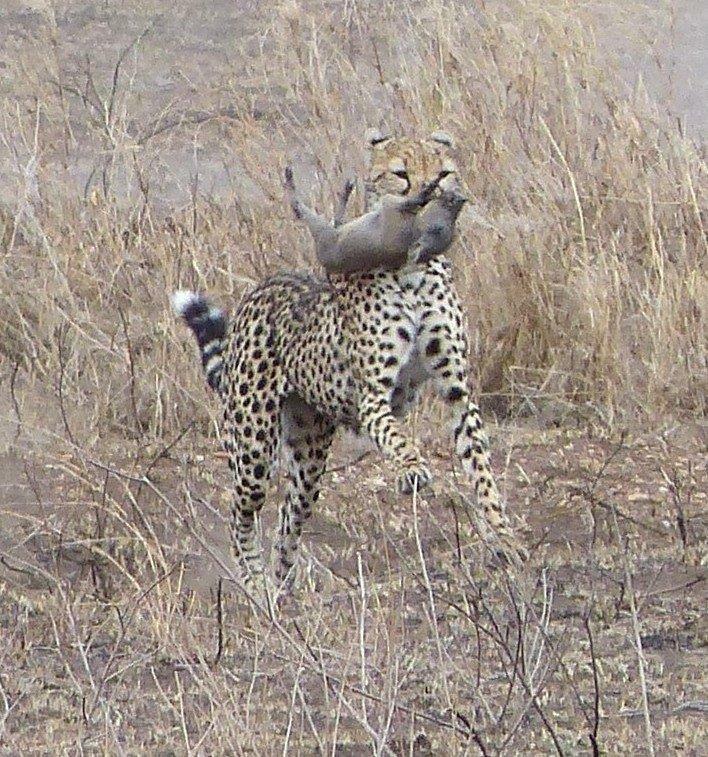 In early light we saw a cheetah take down a gazelle. Angelbert was so adept at observing and interpreting animal behavior. 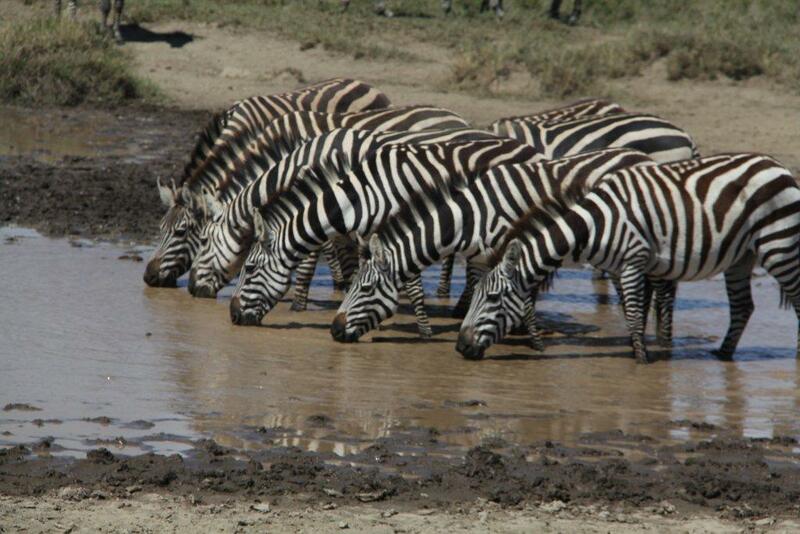 We had been watching a herd of zebra going down to a lake to drink. He noticed that the stallion of the herd suddenly held his head high. Sure enough, there were four lions hiding in a thicket near the water’s edge. It was fascinating to sit close by and see all this. 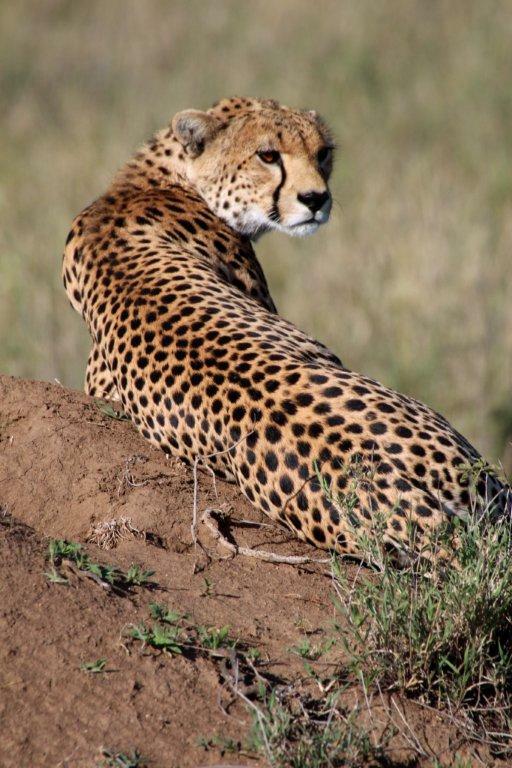 Later, after Angelbert spotted a leopard tortoise, he saw a male cheetah. 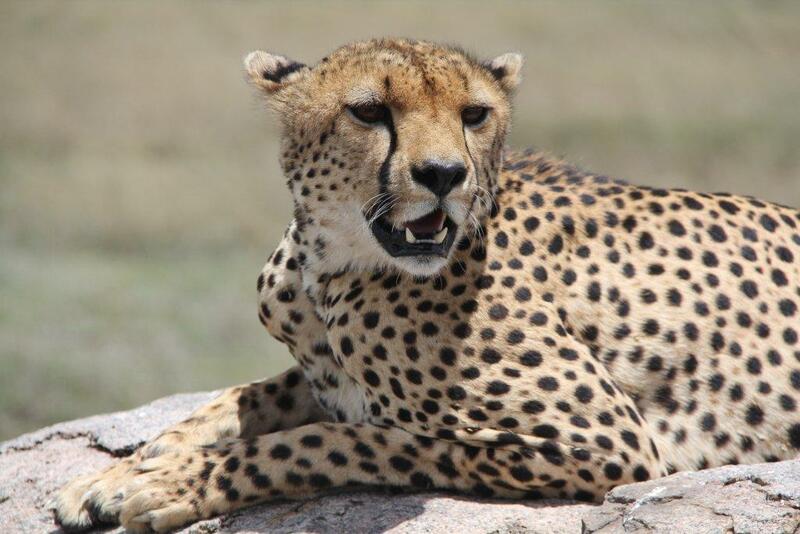 Over the period of about an hour we were able to get within a few feet of this male cheetah. We watched him mark his territory, take a nap, walk to another set of low rock, climb up and look out over the plain. This rock was about the same height and size of our Land Rover. 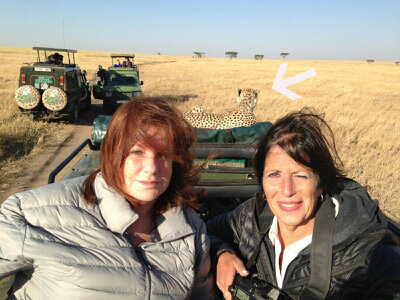 The cheetah hardly even looked at us as Angelbert backed our Land Rover up against the rock, had us pop our heads out the top and took our picture with the cheetah a mere 6-8 feet away. 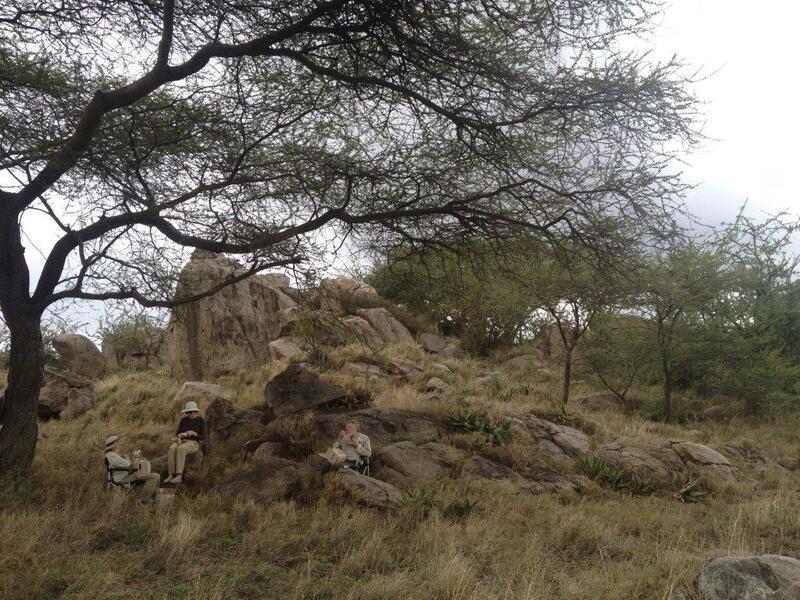 Just before we stopped for a picnic lunch we saw a pride of lions napping on and in the shade of Gol Kopjes. We were again able to get within several feet of the black maned male. Our next two nights were at the Ngorongoro Serena Lodge. This lodge is amazing in its construction of local stone, and its location on the rim of the Ngorongoro Crater. Our room looked out over the crater. While completely different in the type of lodging we had experienced in the other camps, we really enjoyed our stay here. 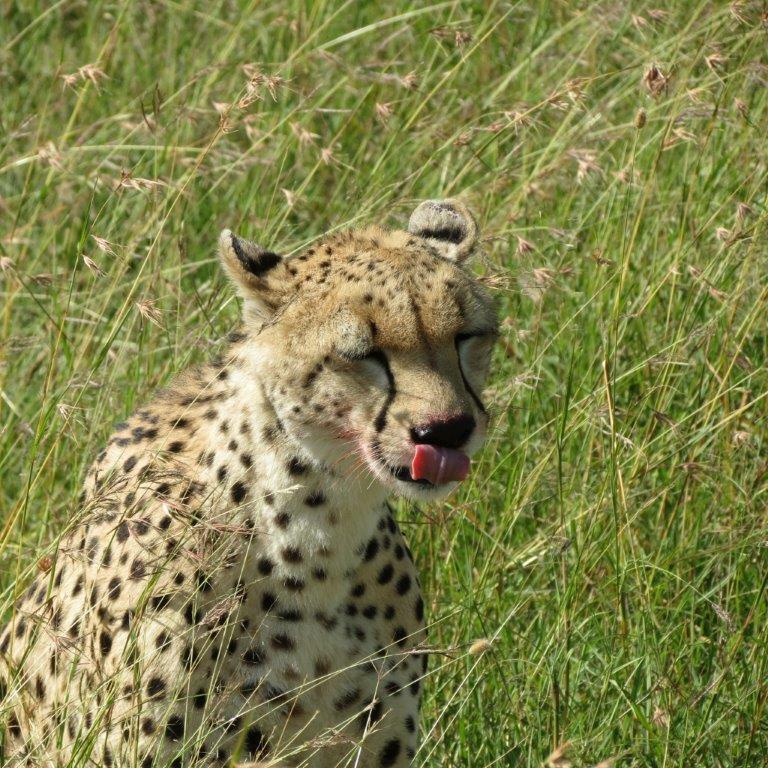 Our room was large and comfortable, and we could get internet access at the bar which allowed us to update our family and friends at home about our amazing experience so far, and that we had not made it on the menu of the local predators so far. (This had been a concern of our 90 years plus parents). We enjoyed the nightly entertainment before dinner, which featured local acrobats, a music/ dance group and a performance by the local Masai in their brightly colored clothing and beaded jewelry. The sunsets and sunrises over the crater were breathtaking! 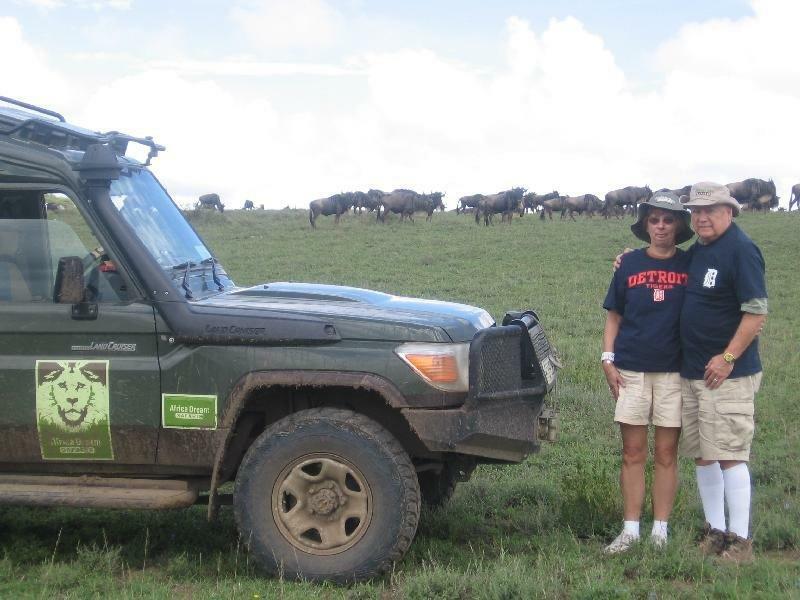 We enjoyed our game drives in the crater each day. The crater floor is abundant in wildlife. 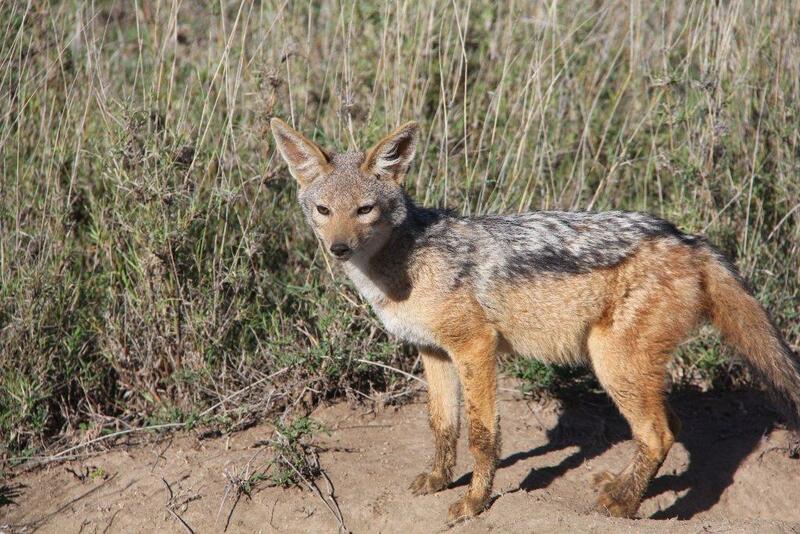 In addition to lion, elephant, Cape buffalo, warthog, wildebeest, zebra, impala, gazelle, baboon, flamingo, ostrich, and hyena, we saw black backed jackal. We saw the black rhino from a distance, and even though Angelbert worked hard all day to get a closer sighting, they were not cooperating that day. 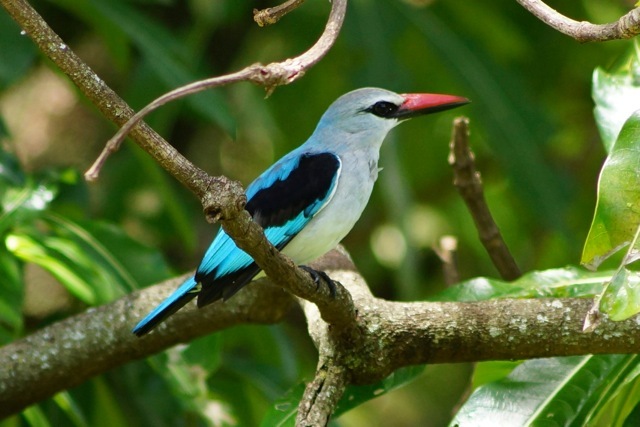 As in other parts of Tanzania we were able to see a large variety of beautiful birds. The end of our second day in the crater ended with a Cape buffalo kill by two lion. 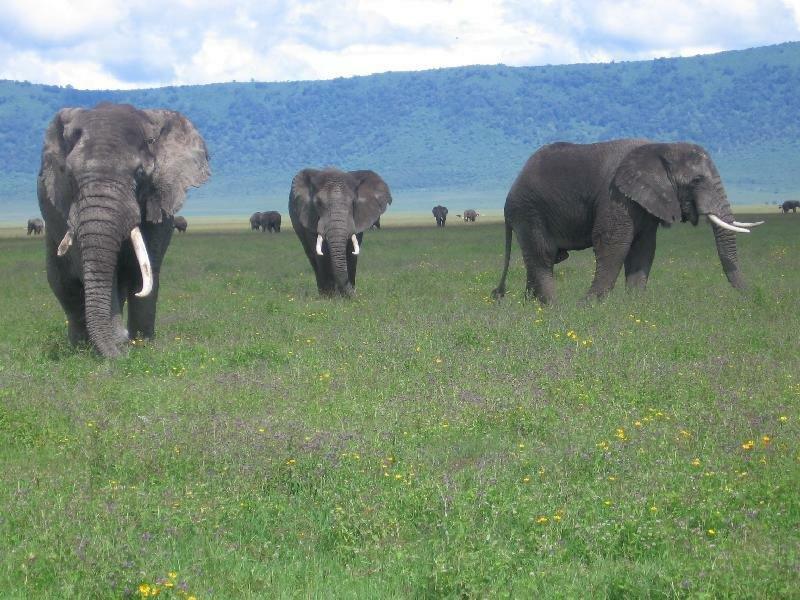 Nov. 8 we headed out of the Ngorongoro Crater area and toward Taranguire National Park. Along the way were took a short tour of a local Masai market where goats and sheep as well as clothing, fruits and vegetables were being sold. We also stopped briefly at a local arts and crafts market so that we could purchase a few souvenirs. Later we stopped at FAME (Foundation for African Medicine and Education). We were very impressed with the work here by Dr. Frank and his wife. They are certainly providing much needed medical care for the local people in a beautiful new facility. We admire ADS for supporting this work. 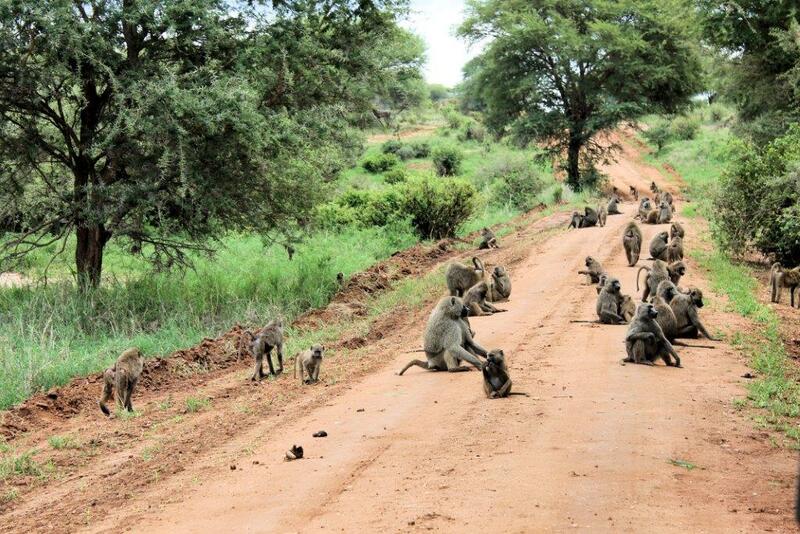 After eating our boxed lunches at the entrance of Tarangire National Park we began our game drive. 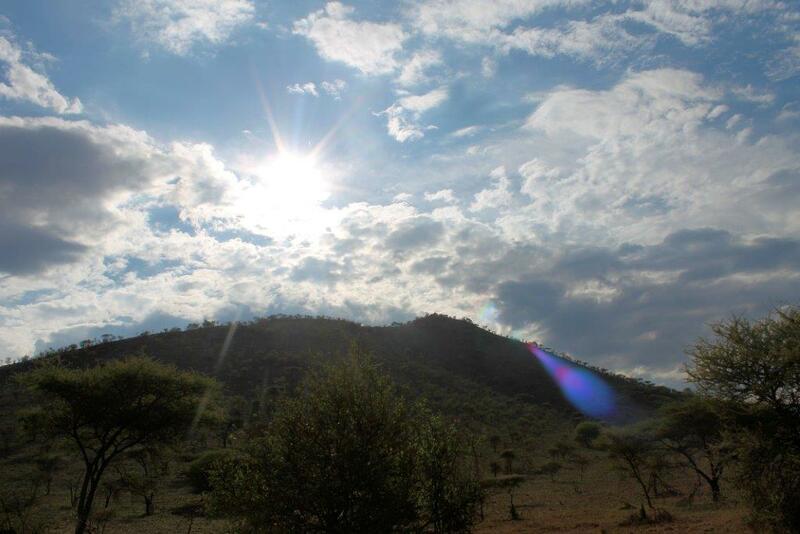 While the temperatures so far on our safari had been temperate, we noticed that it was warmer and more humid here. 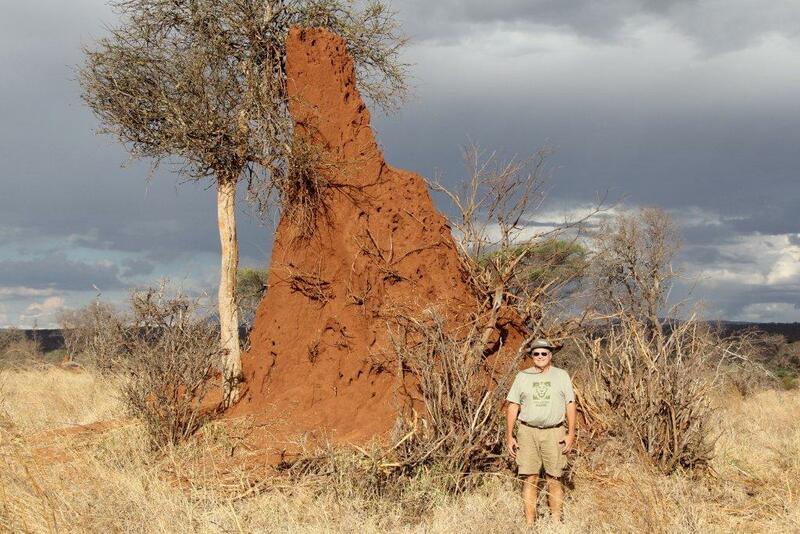 We also experienced Tsetse flies for the first time. This was the one experience of our whole trip that I could have done without. They seemed to find me especially tasty. 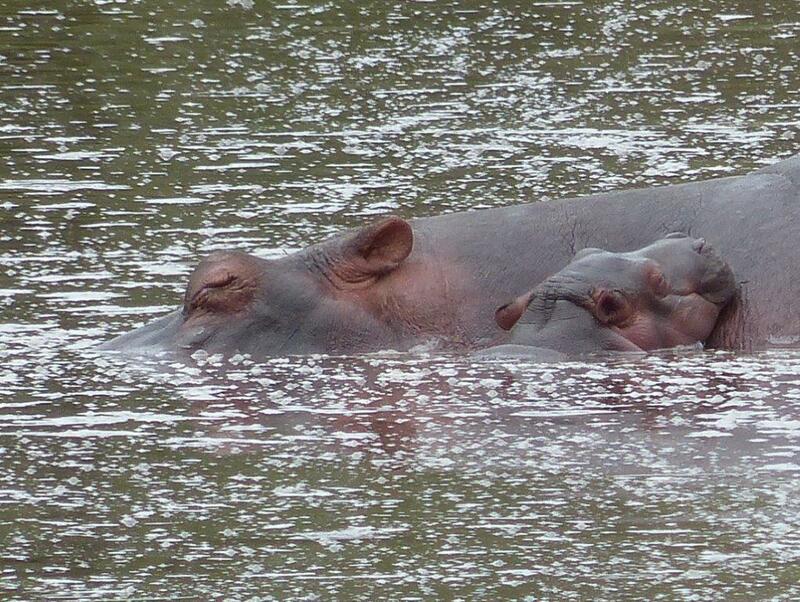 While we still saw a large variety of animals here, the numbers were down due to the rains coming early this year and many animals having already left the park. 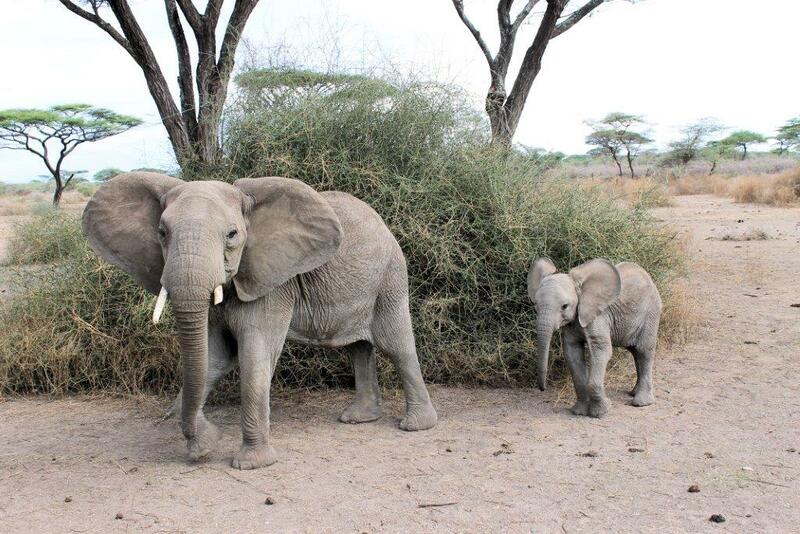 We did have many close encounters with elephants, which we thoroughly enjoyed. 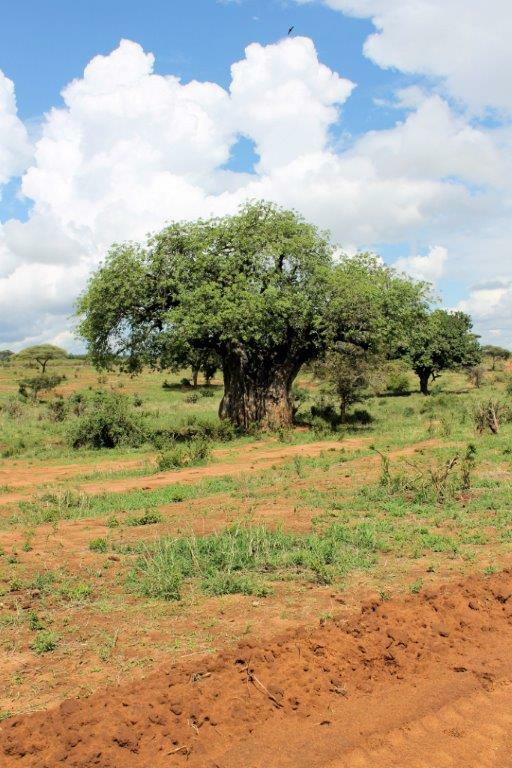 We also enjoyed seeing the enormous Baobab trees and the giant termite mounds. Our final two nights we stayed at Kikoti Tented Camp. These “tents” are up on stilts and also beautifully decorated. Ours faced the evening sunsets, which were absolutely gorgeous. 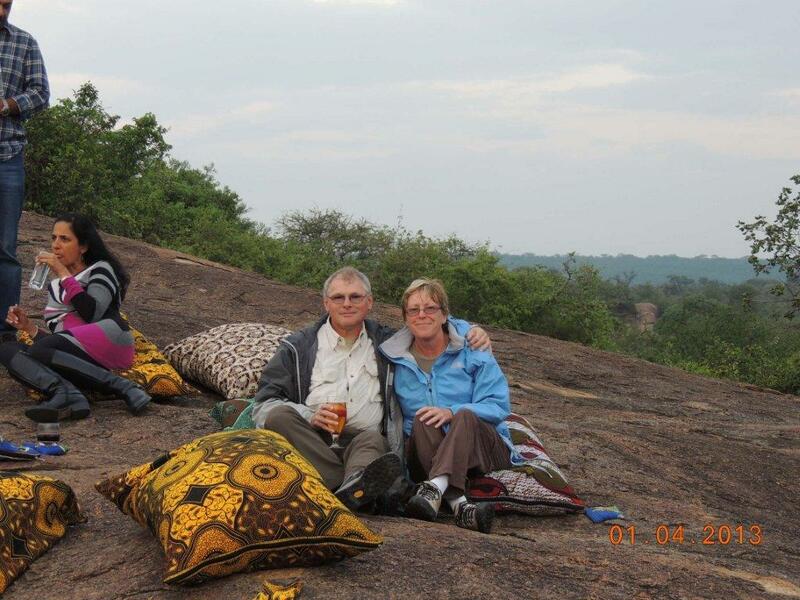 We were able to take time here to sit around the campfire at night and share safari experiences with other travelers. The local Masai sang, danced and jumped for us and then had us join in. They also demonstrated how to build a fire by rubbing two sticks together. The night before we were to depart, the staff presented us with a “Good Bye” cake and sang Hakuna Matata to us. November 10 found us regretting we had to leave beautiful Tanzania with its warm, friendly people, beautiful landscape and amazing animals. Anglebert drove us back to Arusha for our flight home, and after a few hours to shower, pack and rest at the Mount Meru Hotel, he brought us to the airport and even waited there to make sure we had to problems with our departure. We highly recommend Angelbert as a driver/ guide. How he stays so patient and happy through what were usually 10-12 hour days, drove safely on difficult roads, and still managed to spot the animals was unbelievable! 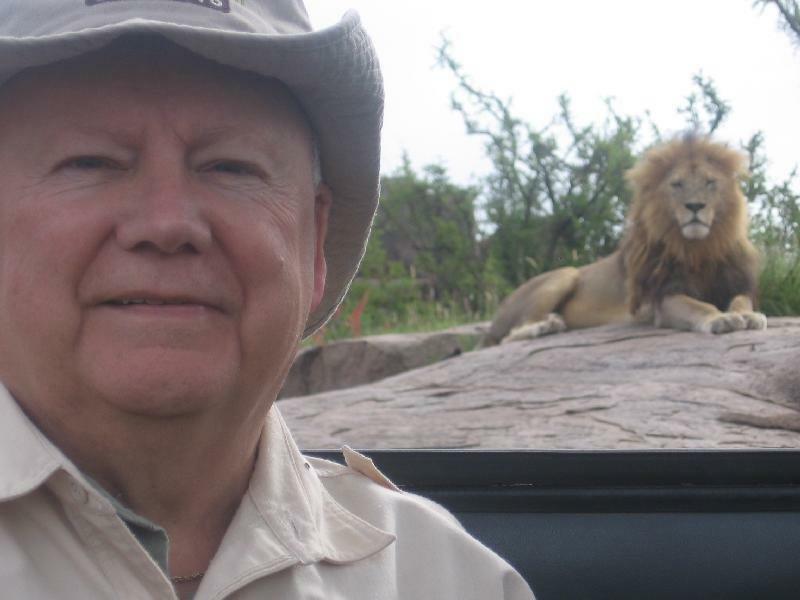 He was so kind and helpful, and has an amazing knowledge of the animals, birds, history, and culture of Tanzania. We also highly recommend Sharon Lyons who was so helpful in planning our trip, making us aware of all necessary paperwork, and changes, and answering our questions. 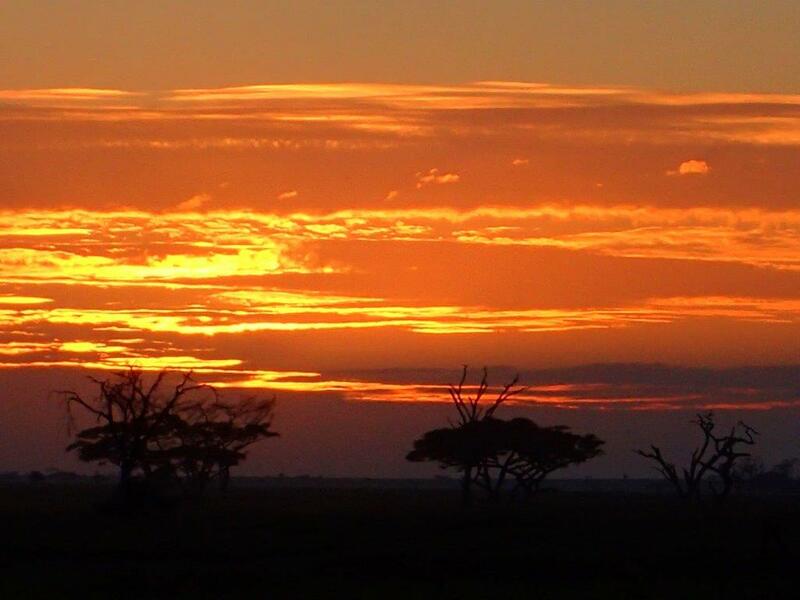 Africa Dream Safaris helped us plan the safari of our dreams and then made it happen. We are recommending you to all who will listen. We definitely left a part of our hearts in Africa and hope to return one day.